Turbo-Gamer. 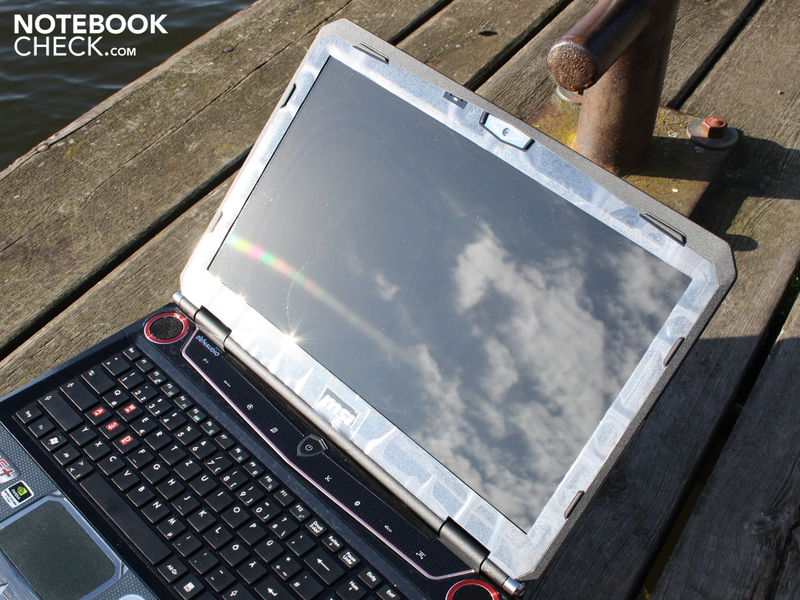 The 15.6-inch device, costing more than 2000 Euro, promises performance and acoustics at their best. 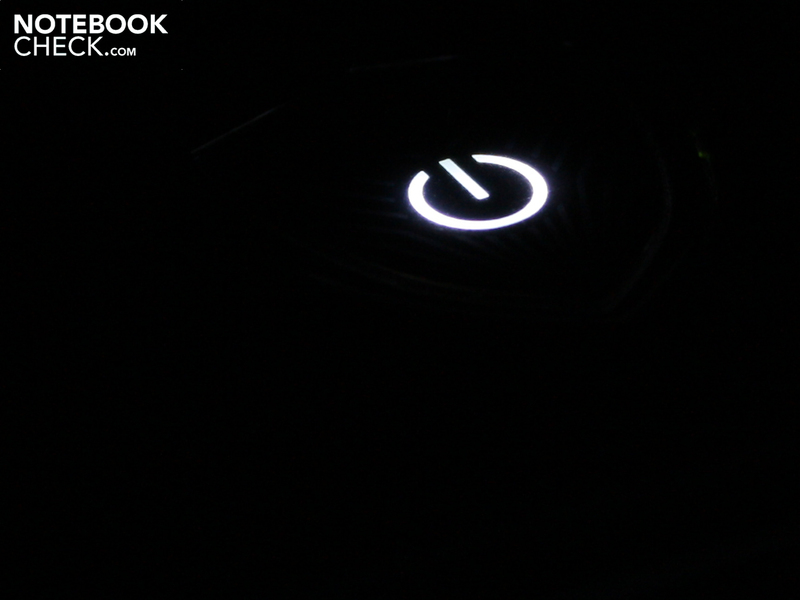 A turbo switch overclocks the i7-740QM as well as the GeForce GTX 285M. 12.800 3DMarks06 and RAID 0 make performance fans sit up and take notice. 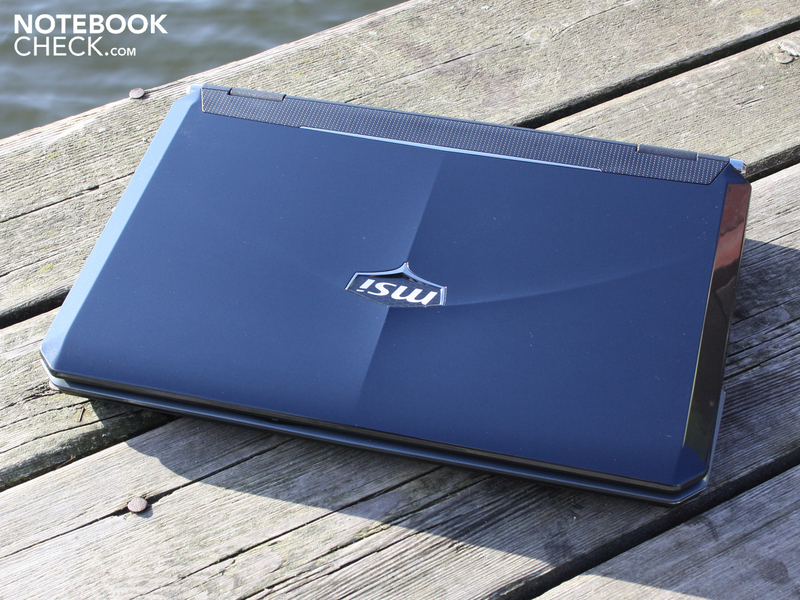 MSI GT660R-i74129BLW7P: high-end gamer with brilliant equipment and strong turbo performance? 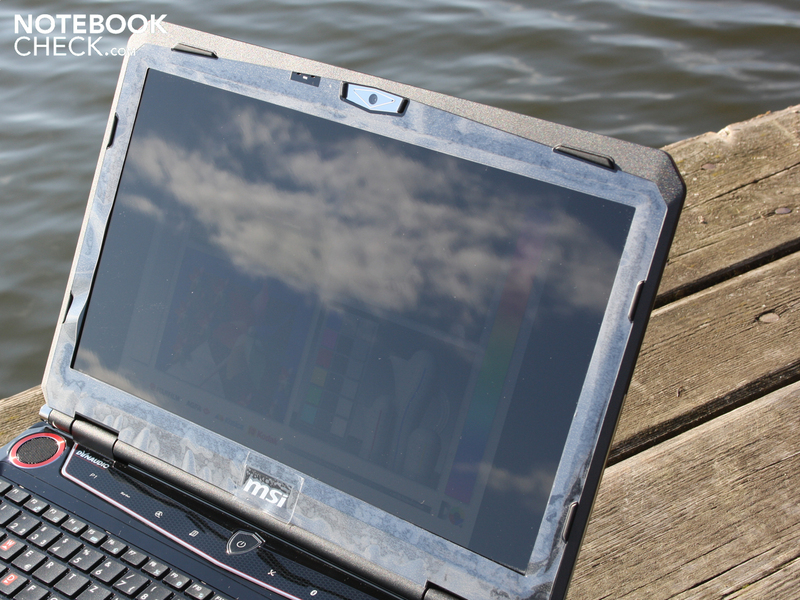 MSI doesn't really belong to the shrinking squad of premium manufacturers, which every now and then produces a laptop for more than 2000 Euro. 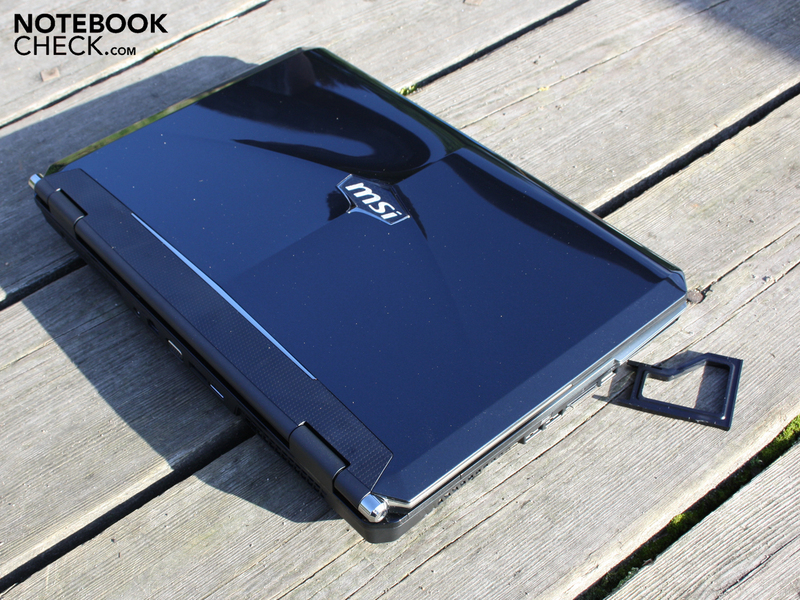 Rather, the manufacturer made a name for itself in the ranks of mobile gaming fans through aggressive pricing for well-equipped laptops. The youngest examples of this are the GE600-i5447W7P (ATI HD 5730 for 800 Euro) or the GX640-i5447LW7P (HD 5850 from 1050 Euro). 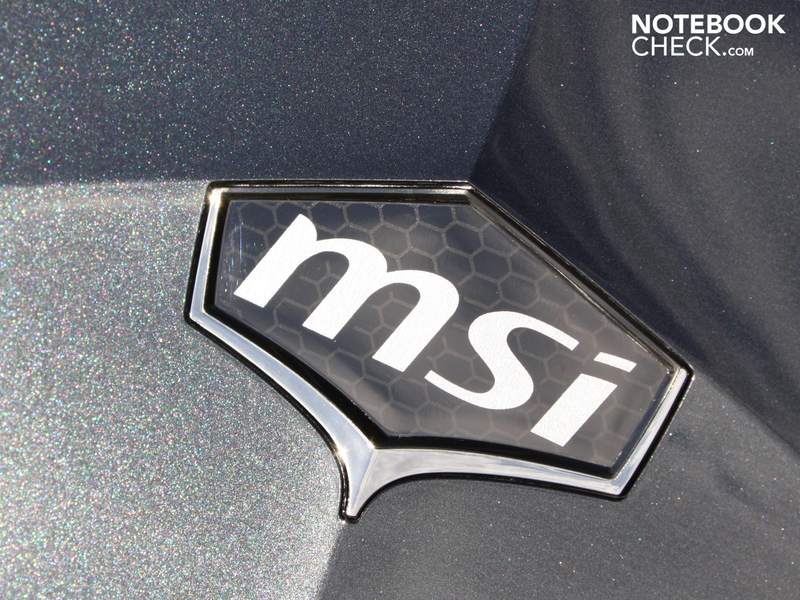 Weak points on the MSI gaming systems were typically the inputs, the system noise or the workmanship. 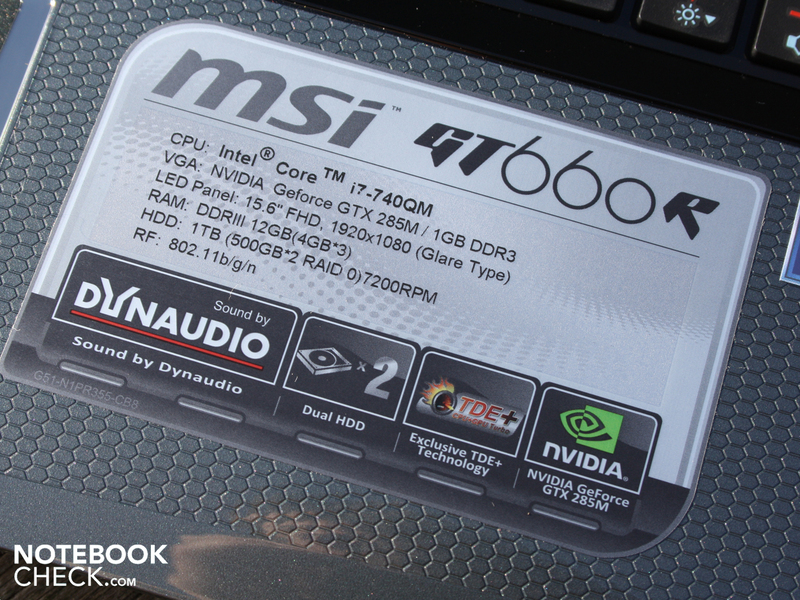 With the GT660R-i74129BLW7P MSI's flagship gaming model is presented. You've got to be rather savvy to want one of these, as the price of 2200 Euro means that only very demanding customers will be able to raid their bank account. Features of the device are two 500 GB hard disks in RAID 0 (speed), the extremely strong Geforce GTX 285M graphics card, the turbo switch for overclocking the CPU and GPU, as well as the built-in sound system from Dynaudio (2.1). In this review we find out if the high price can be justified. Can MSI shake off the weaknesses of the cheaper GT-, GE- and GX-models and make a non-plus-extra gaming laptop? All information can be found in our extensive review. 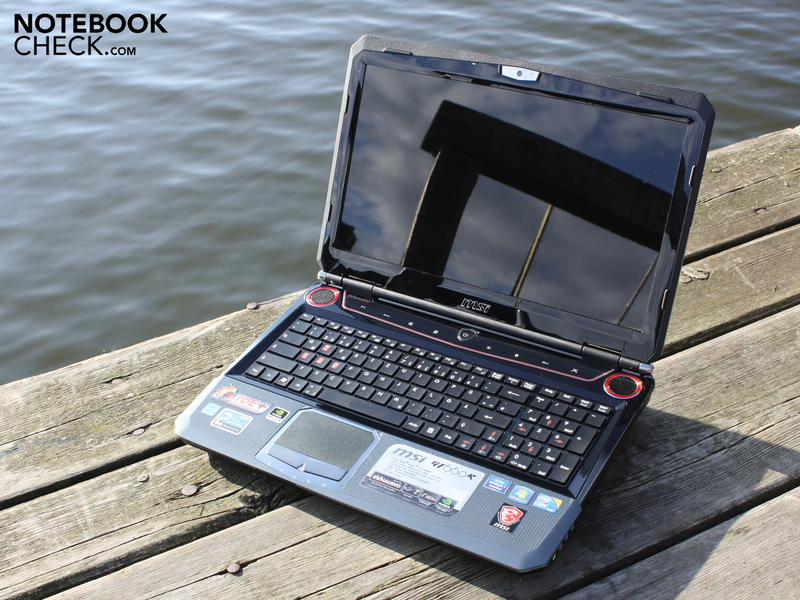 When glancing at the GT660R we immediately think: is someone trying to compete with the Asus G series? The angular, massive form, the FX elements and the blatantly obvious V-formation of the chassis argue in favour of this. However, the manufacturer is far removed from a knock-off. 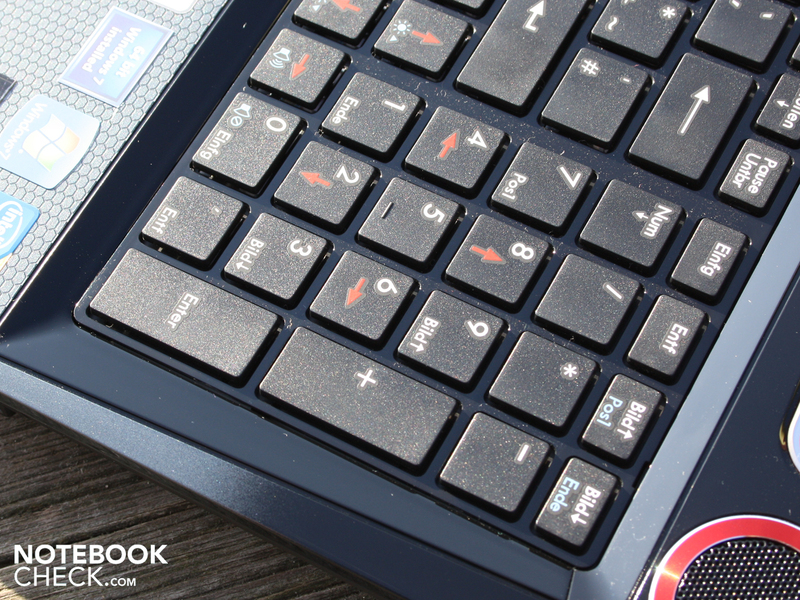 The red border of the special keys (above the keyboard), the silver red loudspeakers and the chrome-coloured touchpad are piled on and emphasise the gaming aspects of the laptop. 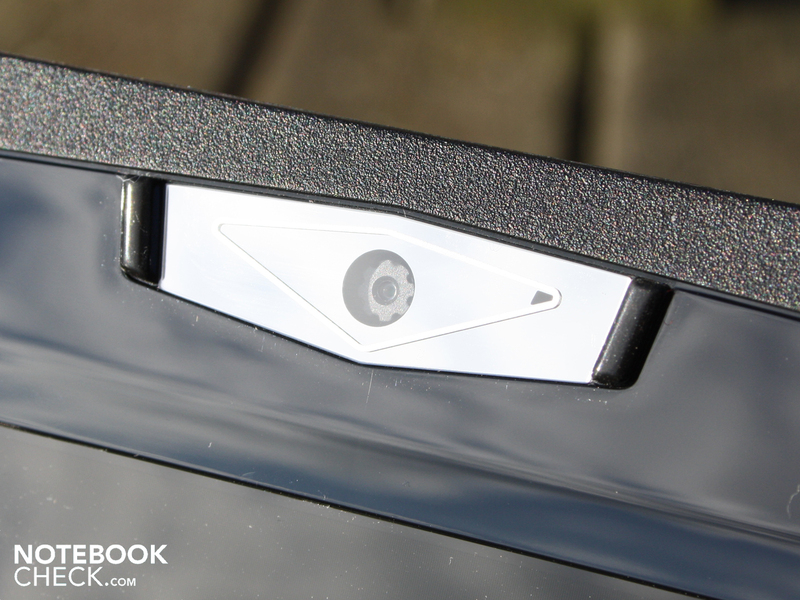 The sufficiently stable lid has no planar surface, rather it's slightly tapered off with the MSI logo. 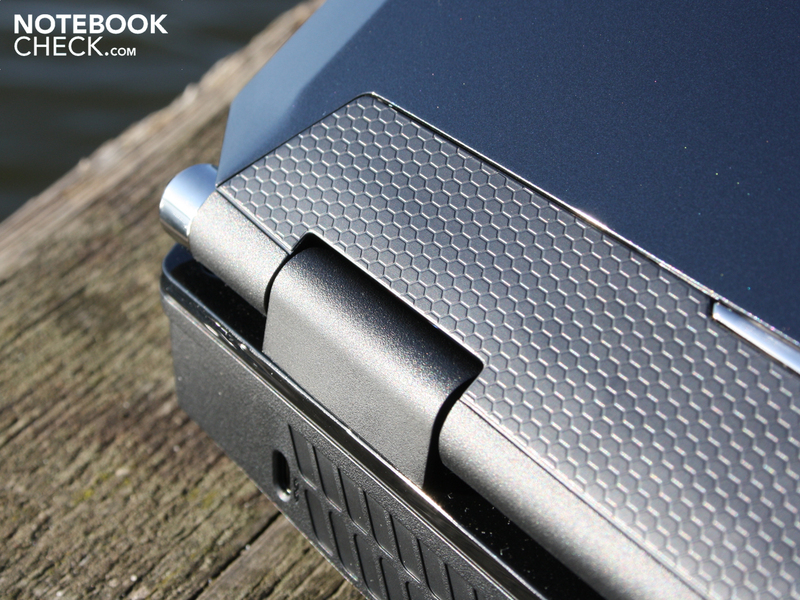 This prominent form of a blunting edge continues in the display border, on the wrist rest and on the touchpad. 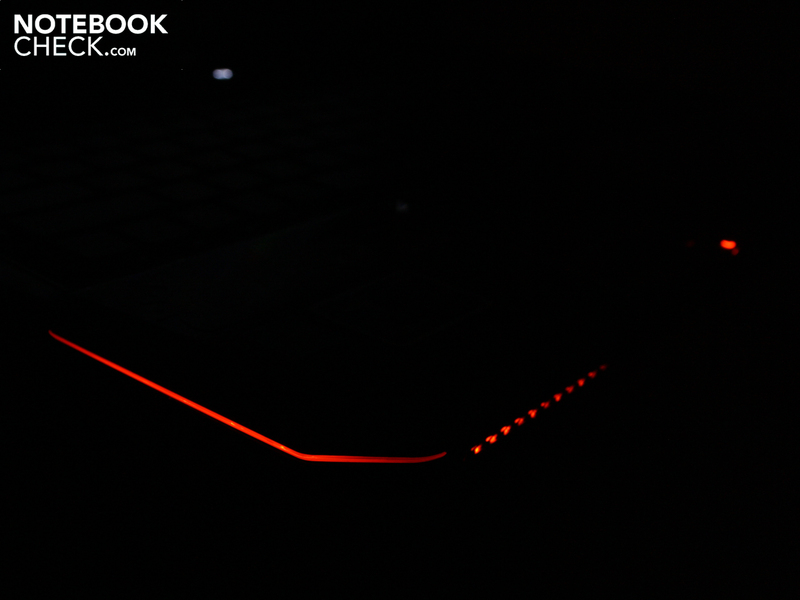 The logo on the lid is also illuminated, like the air inlets on the front and the silver stripes on the lid (right+left surface) and on the wrist rest (right+left). In the outer photos these are noticeable as silver ornamental stripes. Behind the plastic there are, however, LEDs, which illuminate orange. The 3.5 kilo construction isn't built as rigidly as you might assume for its bulk. With two hands we can slightly bend the chassis, yet there were no resulting creaks. No area clearly gives way under pressure; only the area above the keys (special keys i.e. turbo) can marginally be depressed. The honeycomb pattern on the wrist rest makes us expect good grip. However, this isn't so, as the pattern consists of a glossy finish. On the test device it was rather the countless stickers that gave a certain amount of grip to the hands. High gloss is a particular theme on the GT660R. 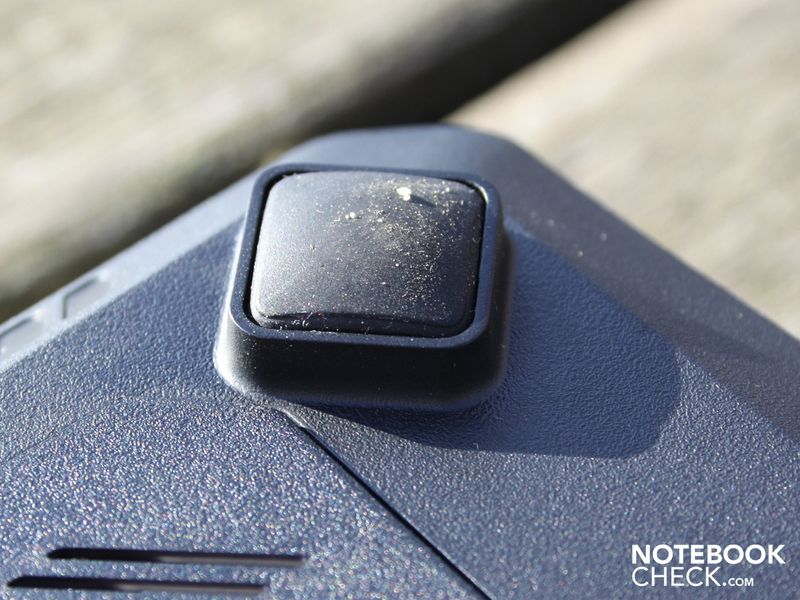 The black surfaces (also the spaces between the keys) attract fingerprints, fluff and dust. It constantly cries out for a polishing cloth, which doesn't even make it into the delivery contents. We often recommend MSI laptops because of their extensive range of connections. 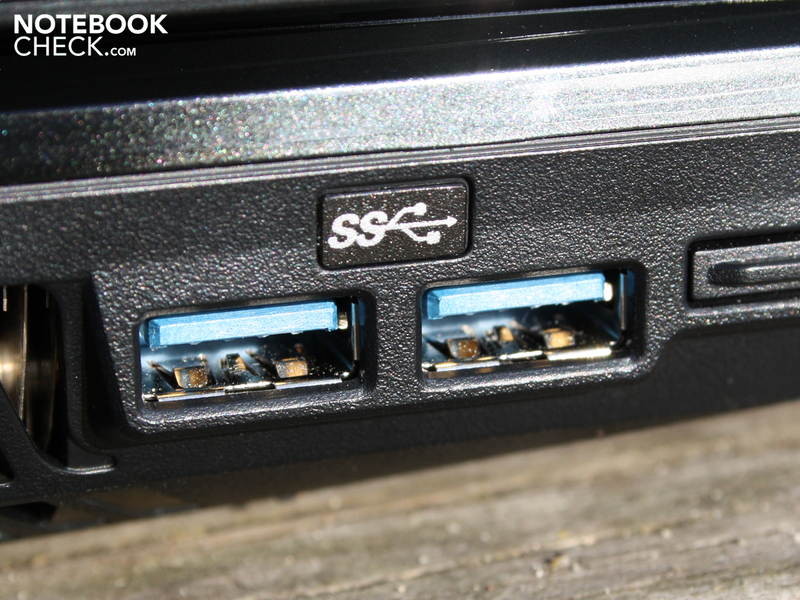 The GT660R splashes out and brings along two USB 3.0 ports as well as ExpressCard54 (upgrade cards). 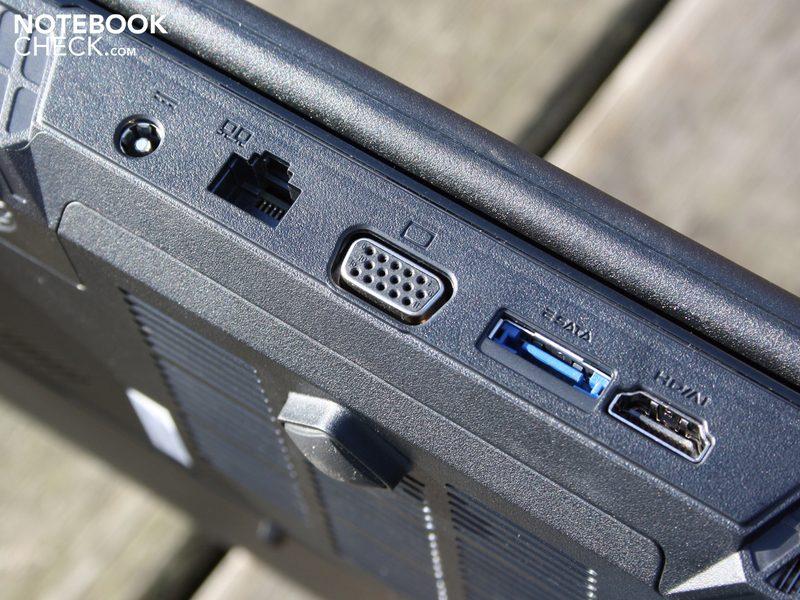 The connections are distributed throughout the three sides of the laptop, which also includes the rear. 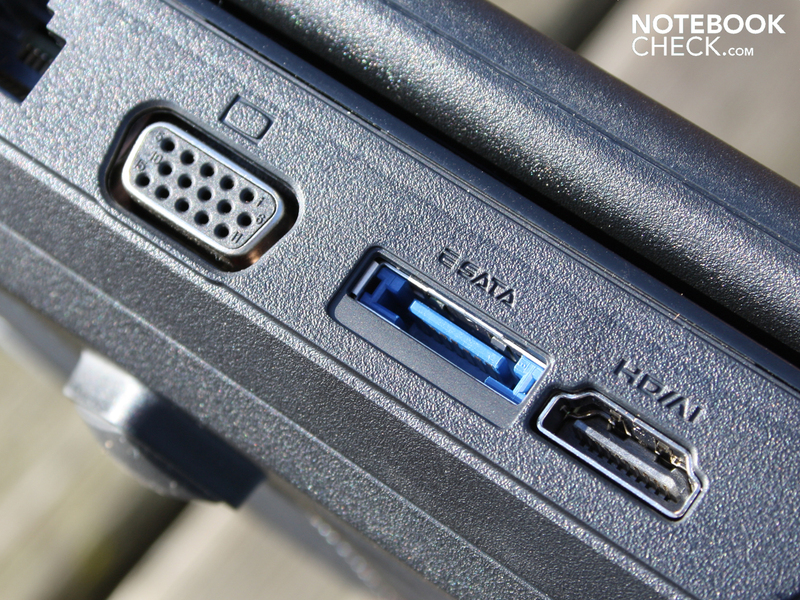 Its use for eSATA, HDMI, VGA, power and Ethernet is pleasant, as it limits cable-chaos on the desk. 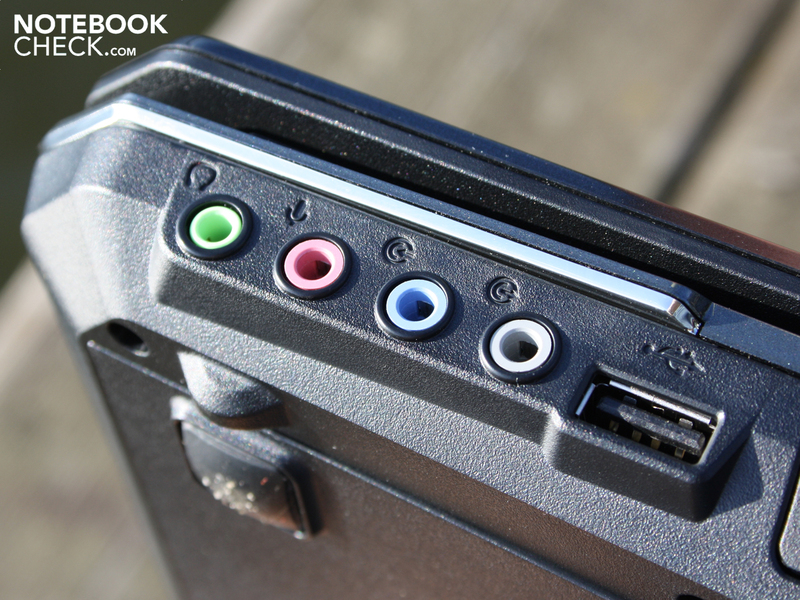 All awkward cables are thus banished from view; only USB and audio remain on the sides. The four audio connections allow connecting a 7.2 home system (analogue) inclusive of SPDIF (optical). The software of the Realtek sound card requests the loudspeaker type (center, rear, subwoofer) after connection. The LED effects don't just know 'on' and 'off'. 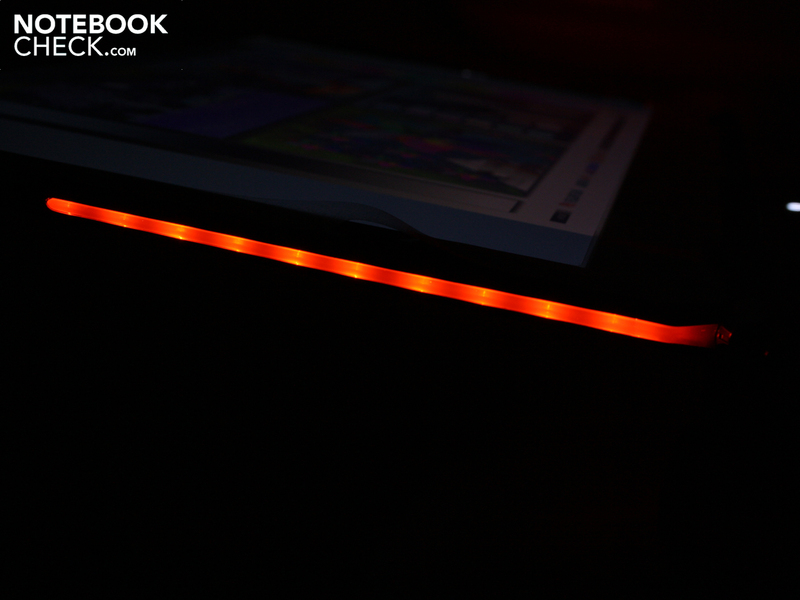 Via MSI LED Manager the user can make the LEDs flicker in sync with audio. 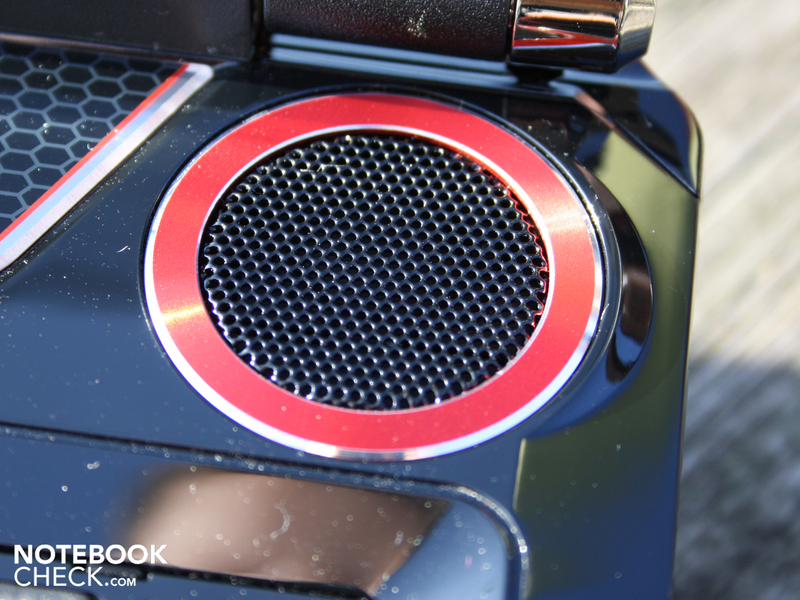 The Sound Source mode make the LEDs illuminate with left-right stereo effects according to the source of the sound. The LED light thus focuses on the direction of the sound. 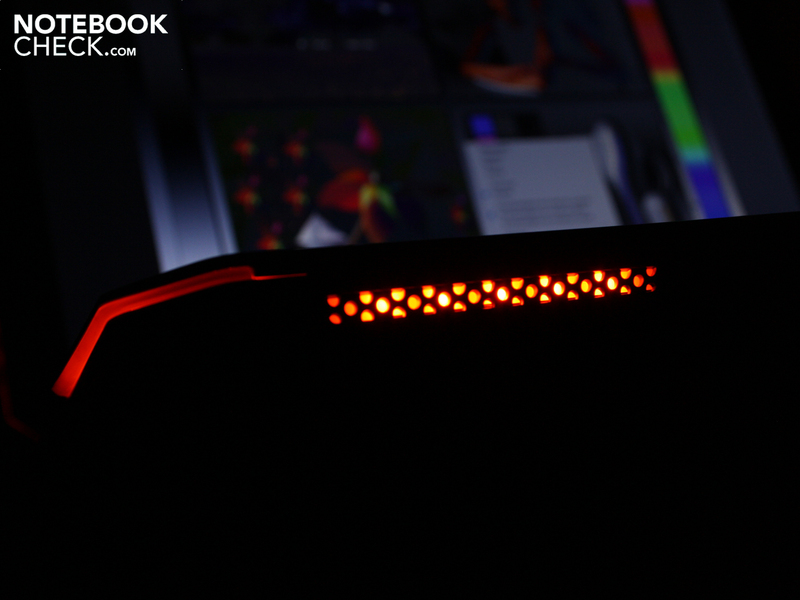 That isn't all: in Alienware Style the "Breathe" mode makes the LEDs do just that in standby (dim and then brighten). Colours are, however, not adjustable. Whilst the manufacturer has tweaked all corners and ends in design technology, we come across usual free-standing keys on the keyboard. 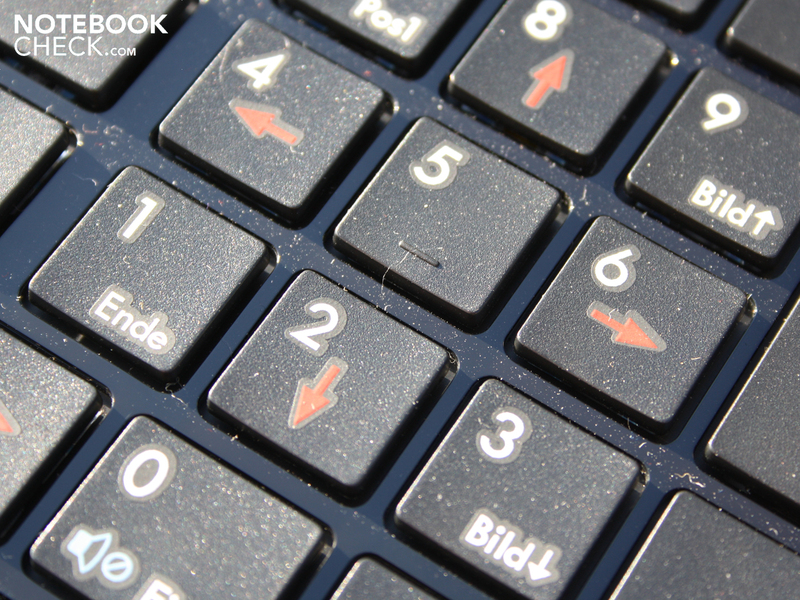 The keys lay like tablets on a glossy black pad, which is emphasised by the large space between keys. Unfortunately the input suffers from a spongy stroke and a few tiny keys (Enter, right Shift). The arrows are narrower than the letters and are squashed below the enter key without sufficient displacement. Typos are the result in hectic video games. Several keys are marked specially for gamers. 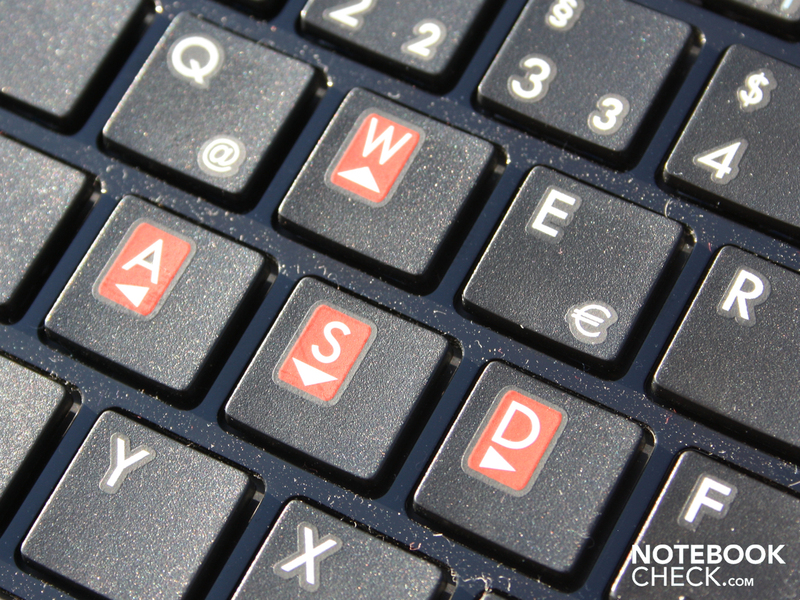 These are WASD (directions) and arrow keys (also on the number pad). The pressure point and key stroke are clear, yet the spongy, springy stroke brings no joy. 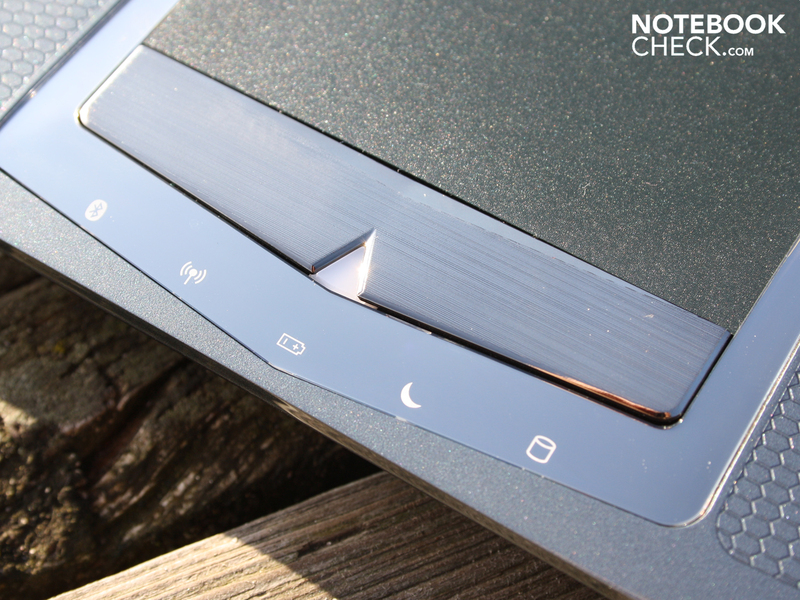 The Synaptics touchpad (V6.2) belongs to the newest touch generation, according to the version number. The new or until now unnoticed EdgeMotion area, which shows the borders of the pad. EdgeMotion should make moving the cursor over long stretches easier, as when reaching the borders the mouse movement is automatically continued. The speed and size of the border areas are adjustable. However, this function doesn't really convince us, as the mouse pad won't play a great roll among gamers anyhow. 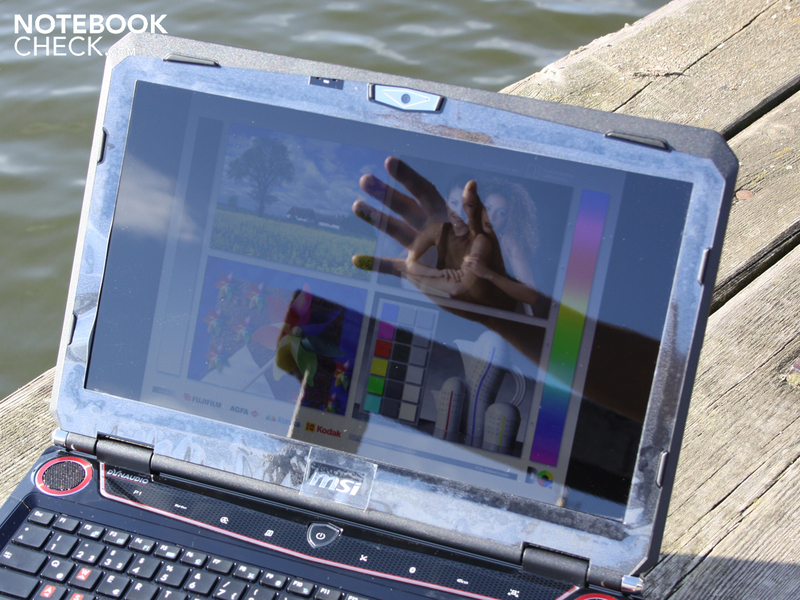 Typical of multi-touch, zooming and scrolling with two fingers is possible. A horizontal and vertical scroll bar on the right and lower sides of the pad help conservative users with navigation. 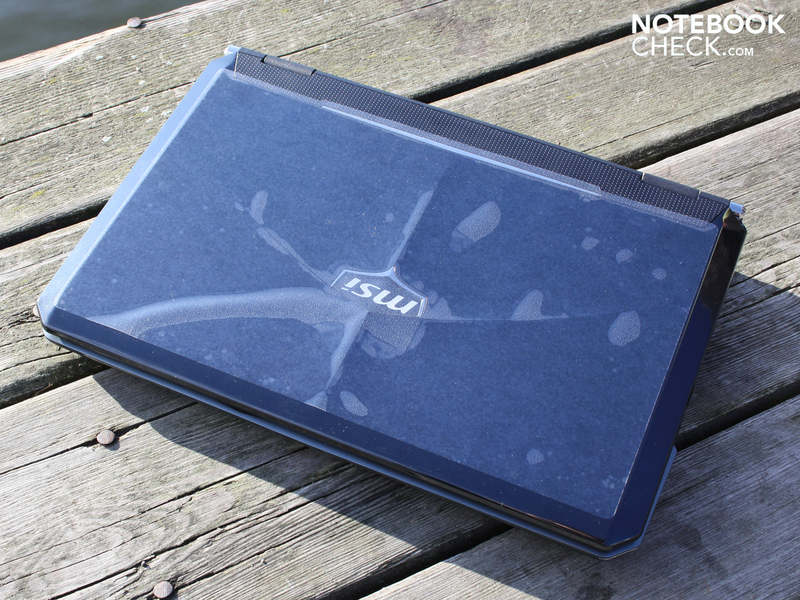 The pad has a glossy plastic surface, which, depending on your taste, is either too glossy or just right. Movements are efficiently carried out, yet it isn't sensitive into the borders. The mouse keys need a lot of pressure and are clearly audible when clicked. The keys have a very clear stroke on the outside, and the further towards the inside we type, the more pressure we need to expend on a shrinking stroke. The most important area for aspiring gamers is the touch bar above the keys. Here your favourite game can be called up (P1 programmable) or turbo can be activated for the CPU and GPU. If you think your GT660R could overheat, you can make the fan run on the highest level at the touch of a button. Bluetooth, WLAN and the light effects can be activated in this area. Finally the Eco key switches between the MSI energy modes (Gaming, Movie, Presentation, Office, TurboBattery, Eco Off). 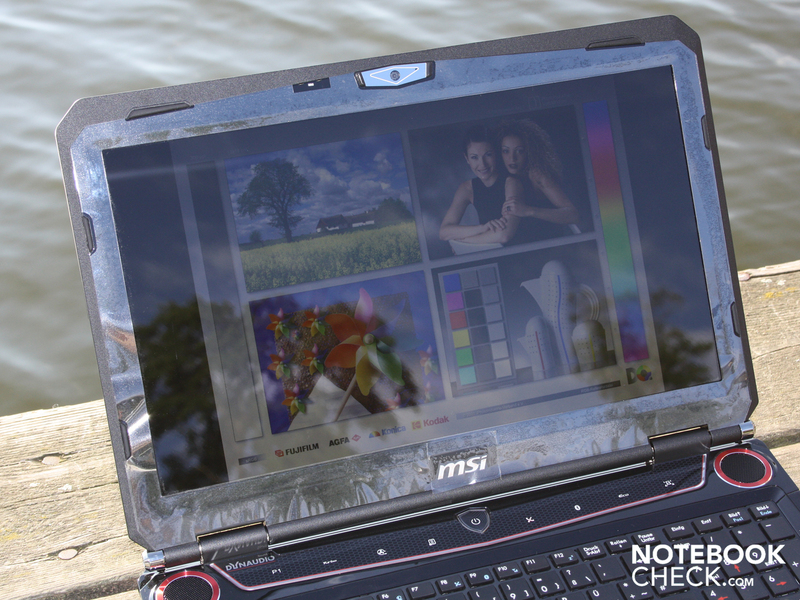 The full HD display of the MSI GT660R has a high resolution of 1920 x 1080 pixels. This provides a very good overview of the screen, which particularly helps when having several program windows open. 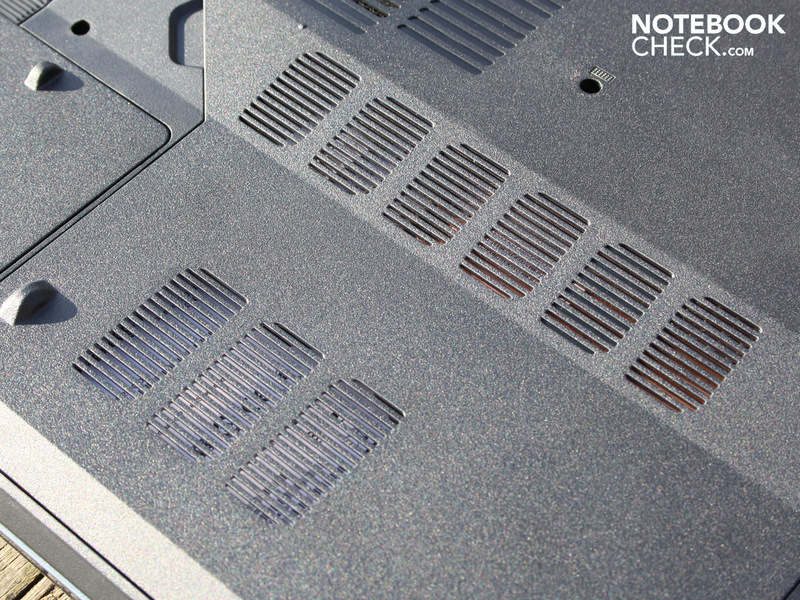 The AUO panel (B156HW01 V5) has no anti-glare coating. This is acceptable for the claim of being a multimedia- and gaming-laptop. 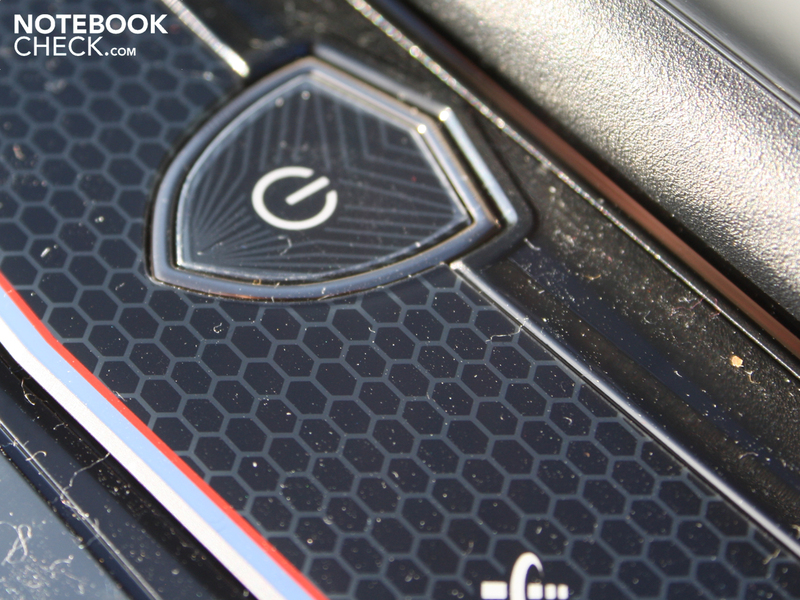 Despite its low contrast, the glossy surface lets the colors of the GT660R look more brilliant. 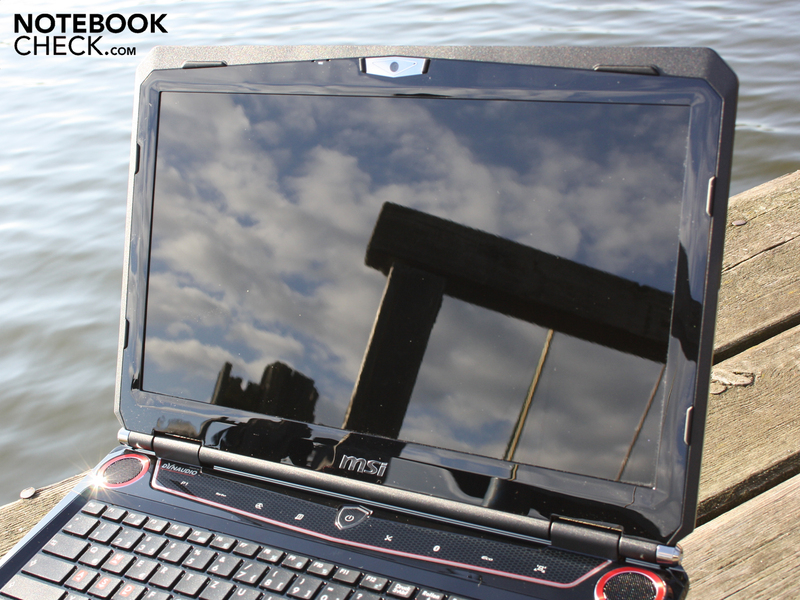 Office laptops typically have a contrast of 150 to 190:1. Unfortunately our test device can't offer more, at 176:1. As for a good contrast, there's nothing of the sort. A good contrast would be between 400:1 and 1000:1. The contrast describes the amount of white of a black surface. Thus black doesn't look quite as crisp and dark as it could be. Customers with a high demand for crisp colours won't be satisfied. Especially considering the high price, MSI disappoints with this weak standard contrast. We measured the brightness of the display and obtained acceptable results. On average luminance was 229 cd/m². LED illumination is very consistent at 92 percent. Indoors, users need at most 150 cd/m². The brightness surplus could be advantageous for use in sunlight. If you go into the sun with the GT660R, you won't have much joy. 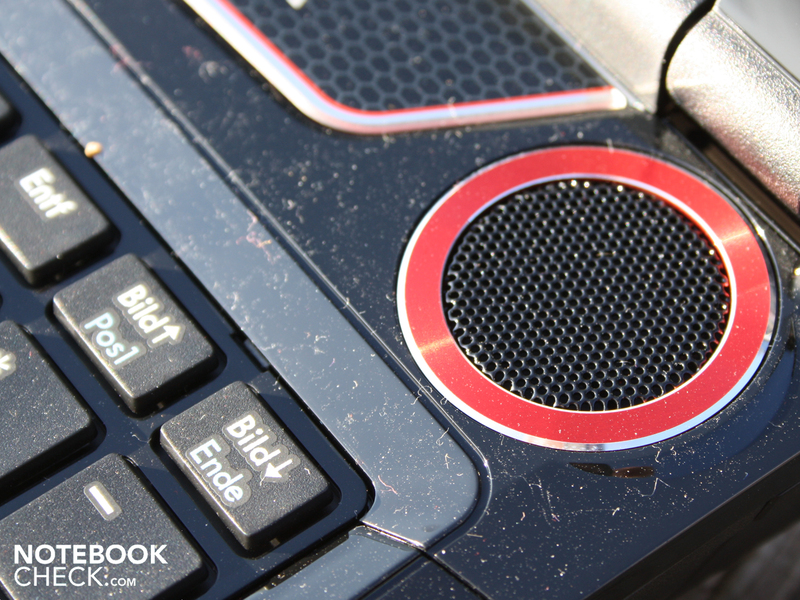 On the one hand fluff and dust on the glossy surfaces become particularly visible. On the other hand the panel lacks an anti-reflection coating (anti-glare). The brightness of a maximum of 243 cd/m² indeed fights against reflections, yet in direct sunlight the panel has few chances. If you want to surf or play outdoors, you'll at least have to find some shade. 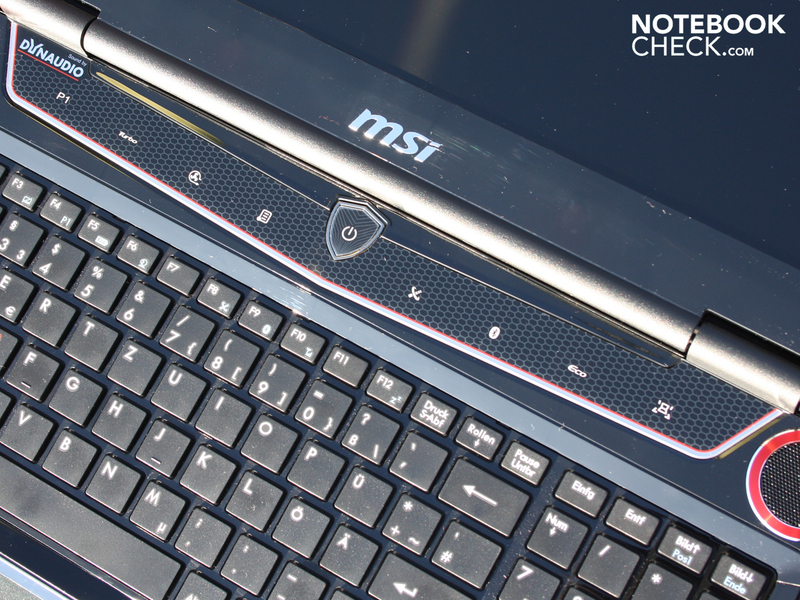 A gaming laptop needs good viewing angles so that a gamer can recognise colours from above and from the side clearly and cleanly, without distortions. This high-quality criterion can't be fulfilled by MSI's GT660R, as the tolerance of the viewing angles as low as most 08/15 office laptops. The vertical and horizontal viewing angles are equally bad. Horizontally the eyes can deviate up to 40 degrees; after this the display becomes dark and colours become distorted. If you look at the screen from below or below you already experience massively inverted colours. Vertically the distortions even begin at 10 degrees. The image becomes dark and the colours wash out. 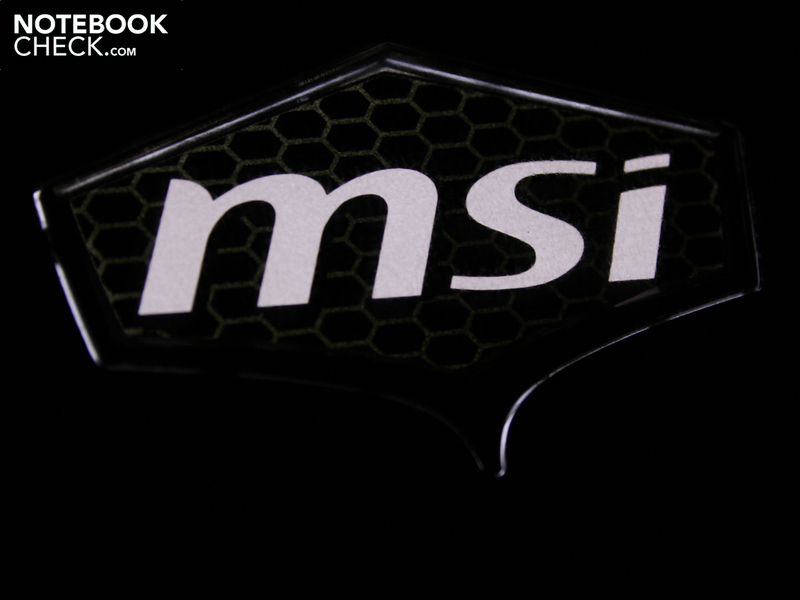 MSI equips its gaming flagship with the rarely deployed, expensive Intel Core i7-740QM (378 US Dollars / 1000 retail cost). The high-end quad-core processor has a relatively low base clock speed (1.73 GHz) but a very high turbo speed (2.93 GHz). The 740QM has 256 KB level1 cache and 6 MB level 3 cache. The TDP is 45 Watt, like its sister model, the 720QM (4 x 1.60 GHz). Intel Turbo Boost means dynamically overclocking the processor according to the application's needs. Individual cores of the processor (also the four virtual threads) are overclocked completely automatically. Therefore the performance should always be available to applications as it's needed. Therefore on an i7-CPU it doesn't matter whether a program or game is multi-core capable. Hyper-threading adds four virtual threads to the four physical cores. Applications can thus access up to eight cores. In this case, not all cores clock at 2.93 GHz, but rather at 1.9 GHz. Only when an individual core takes on the complete computation and the TDP isn't otherwise busy, its clock speed increases to the maximum of 2.93 GHz. Supporting the Core i7-740QM is 12 GB of DDR3 RAM. This maximum amount takes up three RAM slots. The 64 Bit operating system Windows 7 Home Premium can deal with this amount of RAM. 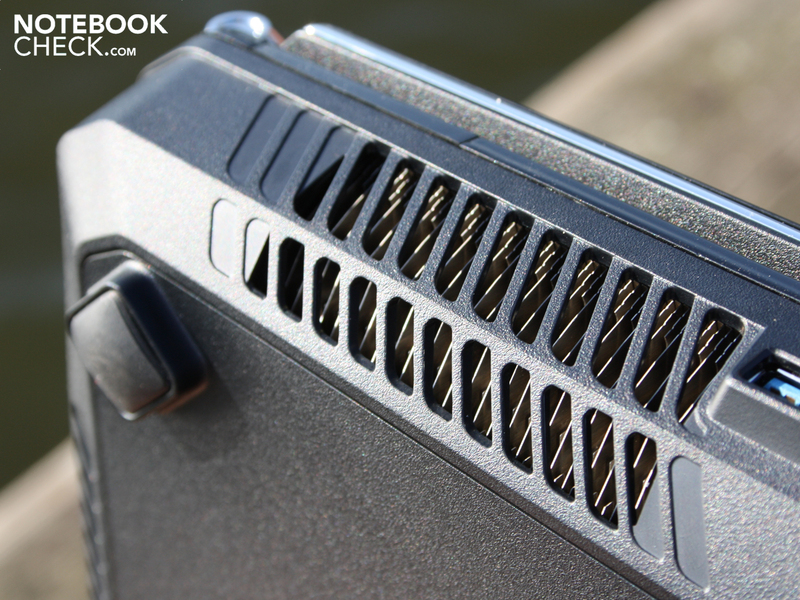 Whether this immense investment pays off in the device's gaming performance remains to be seen. With the higher base clock speed and the higher turbo speed (2.93 instead of 2.8 GHz) the 740QM computes faster than its sister CPU 720QM. 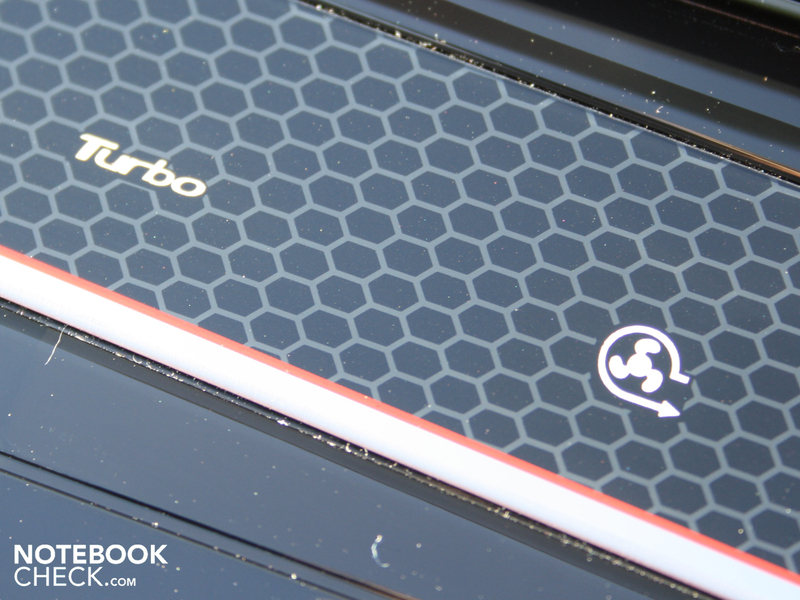 However, it wouldn't be part of the MSI gaming elite if it didn't have a second 'Turbo' feature. This is already the manufacturer's tradition for the CPU. 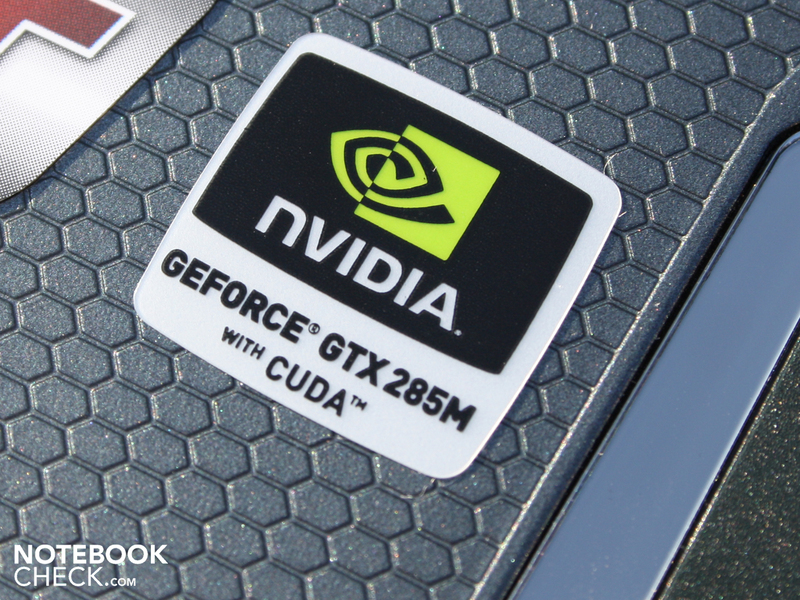 This time the Nvidia GTX 285M is also used in the Turbo Drive Engine+ (TDE+). Can the Turbo feature genuinely speed up applications and games? We started with Prime95 (all 8 threads under load). Normally the clock speed on all cores is 1862 MHz. With Turbo the frequency climbs to 1955 MHz (increase of 7 percent). Cinebench R10 Multi 64 Bit brings the same result. When Turbo inactive we let Cinebench R10 run on one core and experienced the expected turbo speed of up to 2913 MHz. Emphasis is needed on 'up to', as the fluctuations are between 2.378 and 2.913 MHz. When pressing the Turbo button it doesn't change right away, yet we notice that the variations are now between 2510 and 3053 MHz . De facto we're dealing with no absolute but an average MHz increase. In terms of the maximum reachable 3.05 GHz compared to 2.93 GHz it's an increase of four percent. Is this a ridiculous performance increase? The CPU benchmarks (Wprime: 404 instead of 425 second, Cinebench R11.5 CPU: 3.34 instead of 3.19 points) effectively only show advantages of 5 percent compared to normal usage. The Turbo feature also seems to have little effect on application performance, obtained by PCMark05 and PCMark Vantage: 6757 vs. 6548 points in PCMark Vantage (increase of three percent). The CPU-intensive sub-scores like Productivity (5601 vs. 5515) or Music (6484 vs. 6362) only gently increase with the Turbo feature. 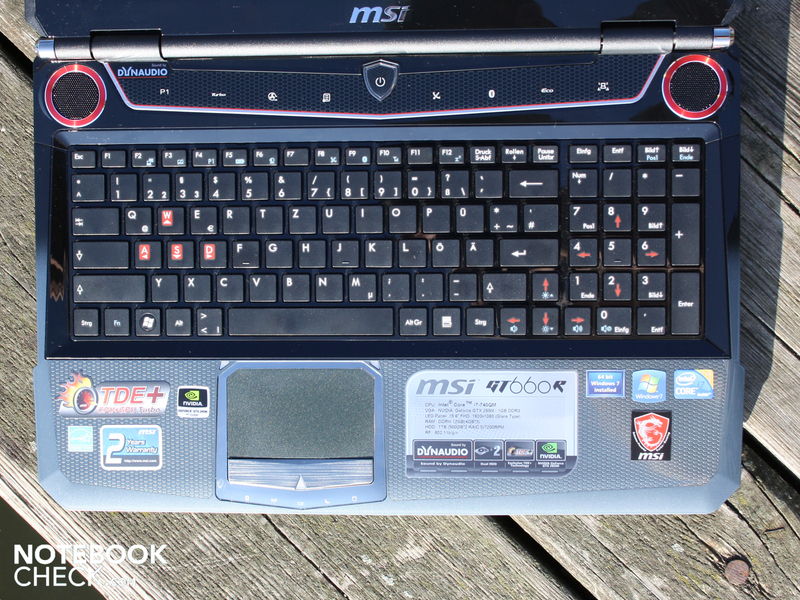 Nevertheless the MSI GT660R is anything but an ol' clunker. Through the higher base speed and the higher turbo speed (3.05 instead of 2.8 GHz) the 740QM computes faster than laptops with 720QM. 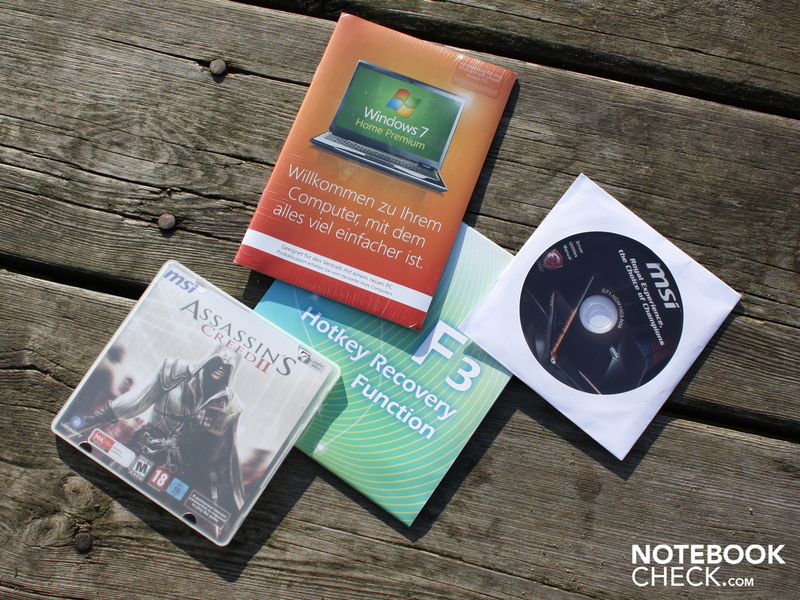 These devices, depending on hard disk and GPU, have scores between 4996 and 6392 on PCMark Vantage. An Asus G73JH-TZ014V (720QM, HD 5870) or an Asus G60J (720QM, GTX 260M), which can be described as its gaming competitors, reach 6392 and 6199 points respectively. The dual hard disks (2 x 500 GB Seagate ST9500420AS) in Intel RAID 0 provide a read-rate of 130 MB/s (sequential HD Tune). The Seagate disks run at 7200 RPM. In comparison to conventional HDDs (5400 RPM, around 65 MB/s) the data flow-rate has doubled. However, the PCMark Vantage HDD sub-score is apparently less impressive, ending with a good but unspectacularly strong score of 3398 points. Even subnotebooks (Acer Aspire 3810T) and cheap office devices (Lenovo ThinkPad SL510) reach this score with 5400 RPM hard disks. The only average HDD score, despite RAID 0 could be down to the access time (movement of the read/write heads) of 18.9 milliseconds. Here the RAID 0 connection is even no quicker than most standard laptop HDDs. The read- and write/heads of the HDD aren't heard when working due to the loud fan. The Nvidia GeForce GTX 285M makes the MSI GT660R a potent games master. The high end graphics card of the 200M series is based on the G92b core (like the desktop GeForce 9800 GTX+) and works with 1024 MB DDR3 RAM. It has 128 unified shaders, which are all activated. The GPU core has a clock speed of 630 MHz (without Turbo 600 MHz), the memory 1020 MHz. 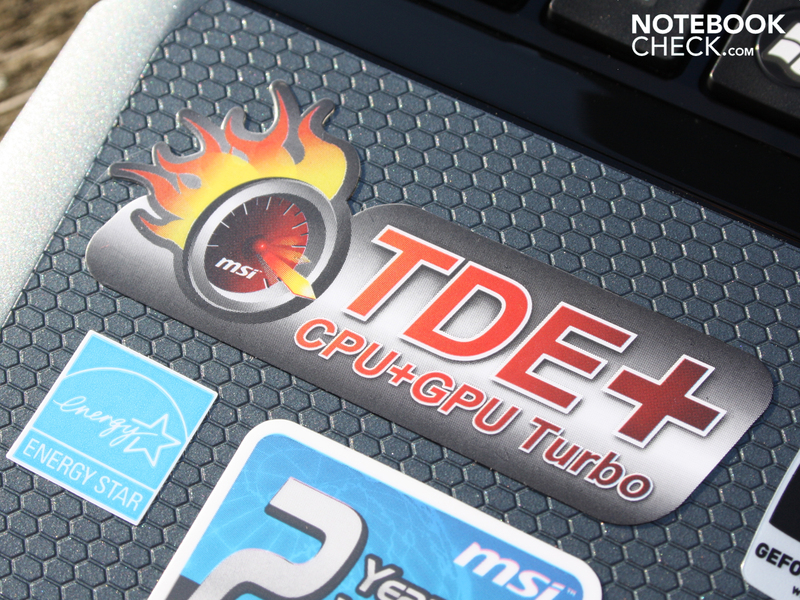 The small increase through the MSI Turbo Engine+ gives us no hope for an increase in 3D performance. 3DMark2006 (Turbo On) comes out with 12840 points (HD 5650: 6674 Punkte) and shows how little is to be expected in terms of performance from the Turbo feature: 12.427 3DMarks06 without Turbo (three percent difference). In the following games we were able to ascertain even a marginal disadvantage with Turbo in the sample (Mafia 2). At the beginning of 2010 the GTX 285M was the fastest single chip card from Nvidia. This is just below a Mobility Radeon HD 5870. Today it's replaced by the Fermi GTX 480M, which offers graphical advantages with DirectX 11 support and also computes faster. We measured where the performance lies exactly with three current games, as well as older but demanding benchmarks in World in Conflict and Call of Juarez. Even in 2006 Techland knew how to demand the maximum from graphics cards. The demanding benchmark can only just be played fluidly (around 25 FPS) with mid-range GPUS (HD 5650, 5750, GT 330M). 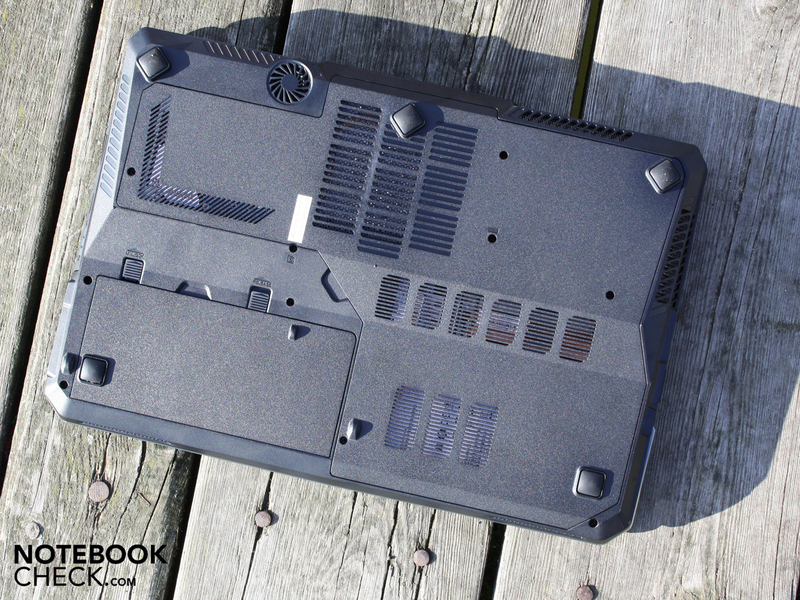 The built-in GTX 285M leaves nothing to be desired and brings 36.5 fps to the scene. The real-time strategy game is no challenge and in our test settings can be played at high (DirectX 10, 1024x768) no problem. 53 fps speaks for itself and leaves lots of space for an increase in resolution. Mid-range GPUs like the HD 5650 run at around 33 fps and leave no room for improvement. If you happily go into underground train shafts, you need to set back the demands and details somewhat. Only in medium is flawlessly fluid game-play possible at 41 FPS. If you adjust the settings to high, you reach an occasionally juddering 21 FPS. Here the GTX 285M reaches its limits. Blizzard's sci-fi real-time strategy sequel has modest demands on the 3D hardware. 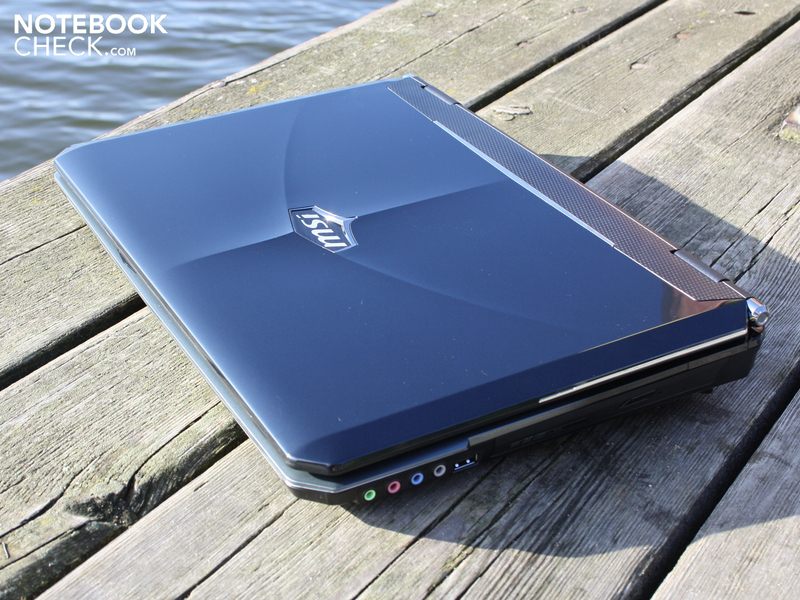 Even with an Nvidia GT 330M high details are (just) fluidly playable (30 fps Vaio F12Z1E/BI). The GTX 285M also allows the user to reach the maximum: 32.8 fps in Ultra, that's to say in native full HD. This value is under that of the brand-new GTX 480M (Deviltech Fragbook DTX, 37 fps). In high and middle settings at 1280 x 800 pixels (preset details/textures high and medium respectively) we measured 61 and 71 fps respectively. Long ago announced by Take 2 Interactive and on the market in a few weeks: the epic Mafia II. We could even enjoy the shoot-outs in the integrated benchmark of the demo with ultra settings (full HD, high) at a fluid 37 fps. Only the GTX 480M (Deviltech Fragbook DTX) can haul out a few more frames with 41 fps. The difference to the GTX 480M is also seen with high settings: 21 vs. 31 fps. 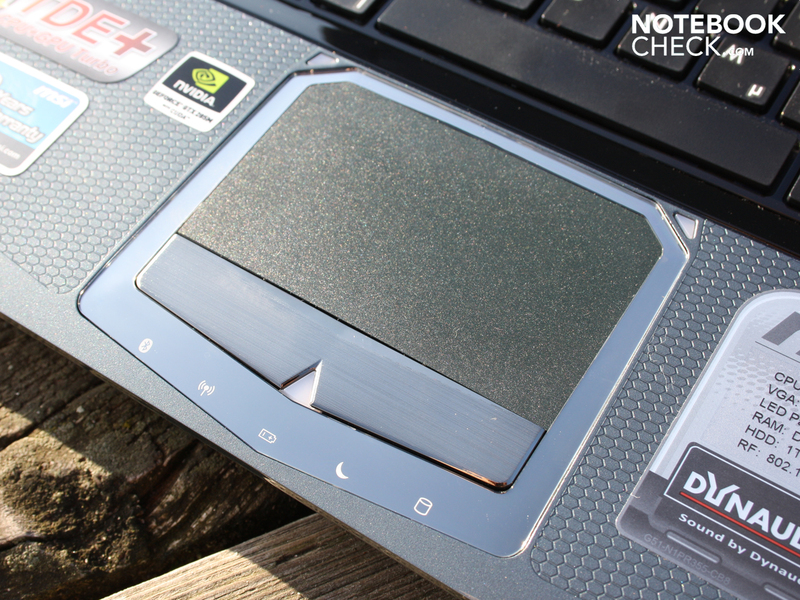 Mid-range GPUs like the HD 5650 (Acer TravelMate 7740G-434G50Mnss, 14 fps) are well beaten. In Mafia 2 we turned on turbo at high and ultra and reached marginally worse results. High: 53.6 vs. 52.2 (Turbo Off vs. On) and respectively Ultra 38.4 vs. 36.9 (Turbo Off vs. On). The performance of the GTX 285M suffices to play all current games (2010) with at least the middle detail level. Demanding games like Metro 2033 can't be played fluidly at maximum details. Other and above all older games were, however, no challenge and ran in part in Full HD at maximum details (StarCraft 2, Mafia 2). 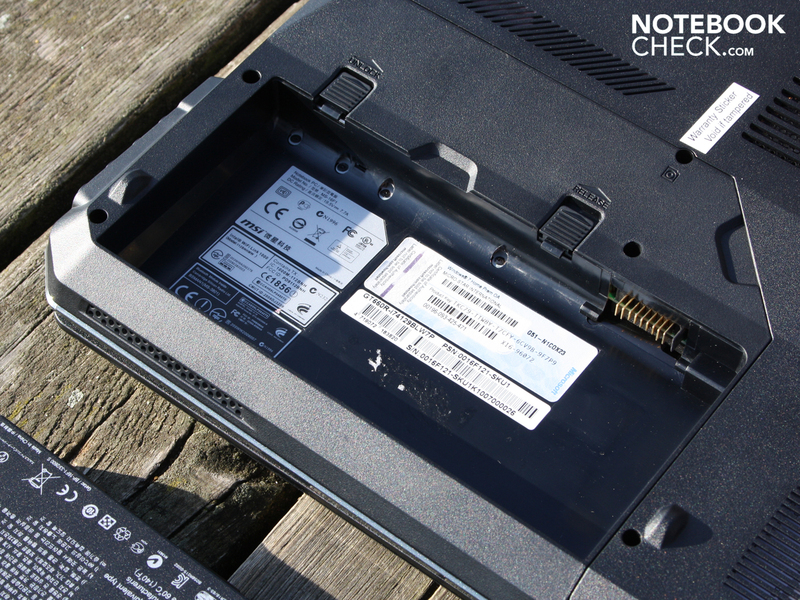 We take high system noise on gaming laptops with a pinch of salt, as the strong quad-core CPUs, like the 740QM, and 75 Watt GPUs, like the GTX 285M, give off a lot of waste heat under load, which has to be carried away from the case. For this reason, temperature-sensitive gamers can have direct control over the fan in the form of a fan switch (Cooler Boost, alongside Turbo button). This has no effect on the performance/clock speed; it merely makes the fan constantly run at the maximum possible rate. This generates (with and without load) an ear-numbing noise level of 51.2 dB(A). The switch is almost pointless, as the ventilation can regulate itself up to the maximum rotations. However, the temperature-conscious user at least has a sense of control. 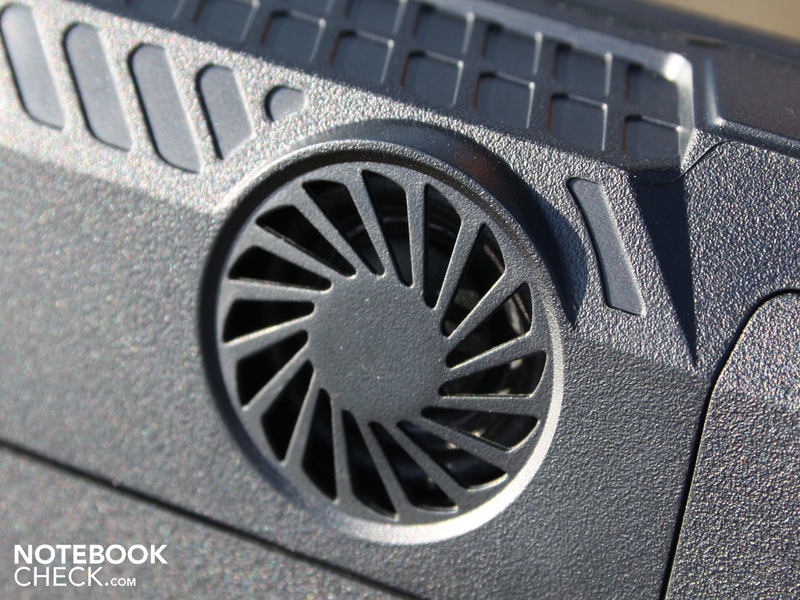 In our gaming benchmarks the system noise is up to 42.8 dB(A) (Turbo Off, Cooler Boost Off). 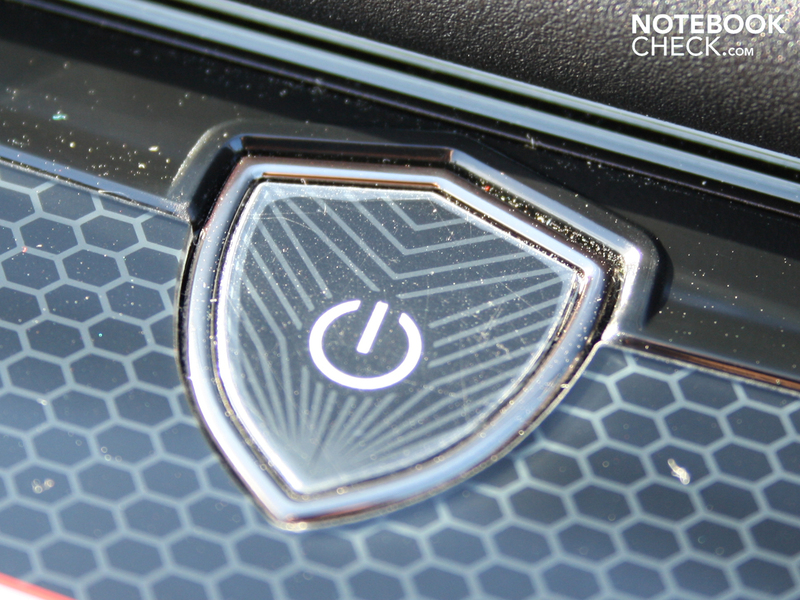 If you turn on Turbo and Cooler Boost, you reach a constantly noisy level of 50.9 dB(A). In the stress test (GPU + CPU) over several hours the GT660R is 50.6 dB(A) loud without Cooler Boost and without Turbo. 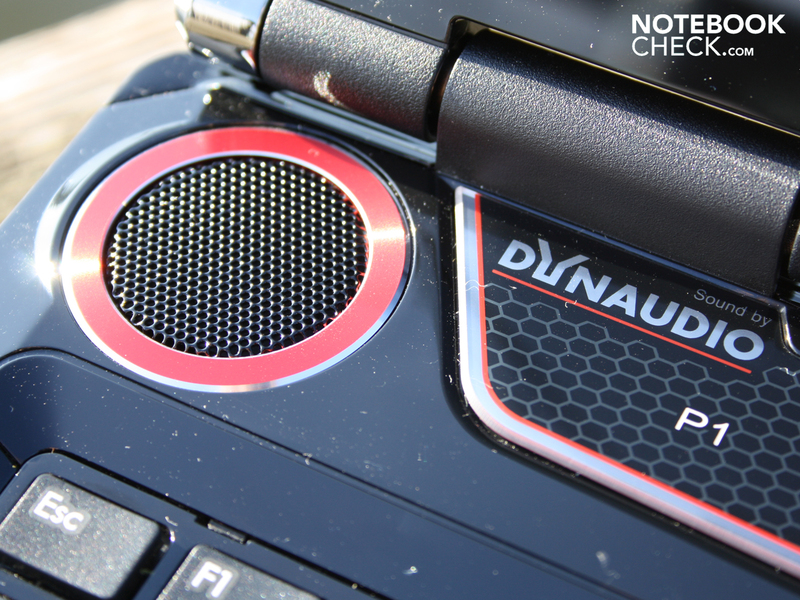 If you then turn both on, you again hear a constantly noisy level of 51.2 dB(A). 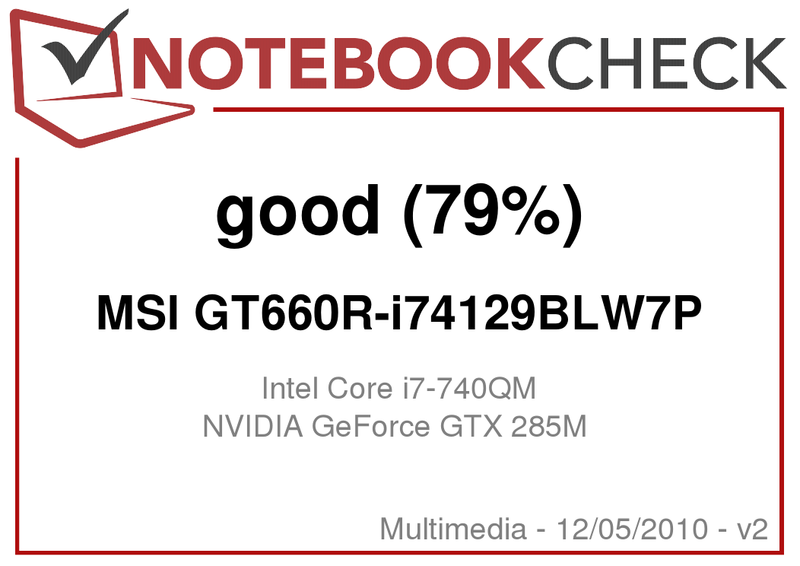 Unfortunately the MSI GT660R isn't quiet when idle and without Turbo. With activated energy-saving mode (Eco Mode Turbo battery and then high performance) we measured 35.2 and 38.7 dB(A) respectively. At least now gaming fans should deactivate turbo, as it gets even noisier: 39 and 42.9 dB(A) respectively (Turbo battery and then high performance). Can the noisy fan at least carry the heat waste away from the chassis? In principle yes, the temperature graphs only show selective excessive heating on the underside (maximum 59.2 degrees Celsius). The remaining areas remain considerably cooler (24 to 34 degrees) and thus produces an acceptable average of only 33 degrees Celsius. When gaming the wrist rest area and the keyboard remains pleasantly fit for work at 26 and 32 degrees respectively. The Cooler Boost was activated in the stress test for the temperature measurements, as we wanted to give the GT660R the chance of the best possible cooling performance. 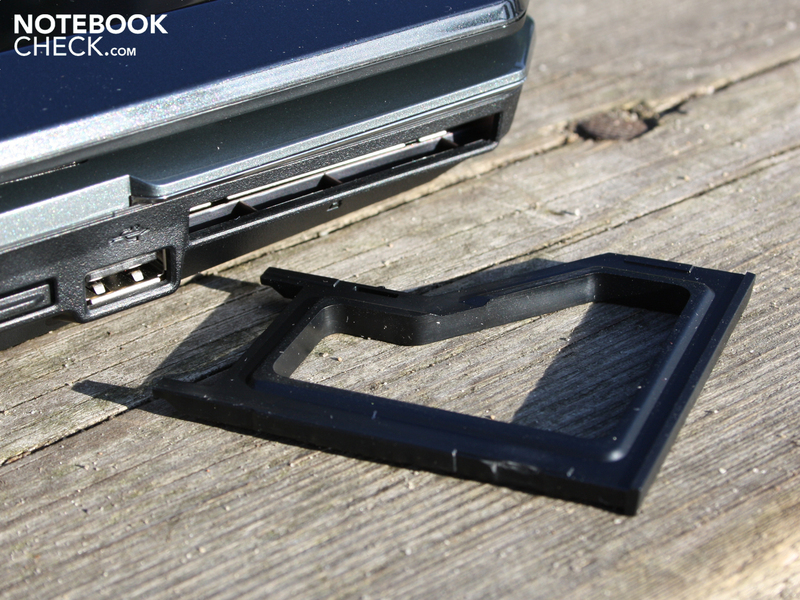 Users should keep the numerous air outlets of the base plate free when playing games. Carpet or quilts should be taboo when gaming. When idle (Turbo off, Cooler Boost off, Turbo Battery mode) the case remains very cool at 26.3 degrees (average on the upper side). The underside is no worse at 27 degrees. The formerly warmest point of the base plate is now warm to the touch at just 30 degrees. The eight-hour stress test had no negative influence on the system's stability (no thermal throttling, no crash). However, the CPU heated up to 97 degrees (GPU maximum 82 degrees) (Stresstest with TDE+ On). The manufacturer designates the sound with Dynaudio loudspeakers the most important feature. MSI has optimised the overall sound with its own specifications regarding the positioning of the speakers/subwoofer, their performance, the frequencies and the Realtek sound-card (ALC888). MSI integrates a 2.1 system de facto, so stereo loudspeakers (above the keys) and a subwoofer (underside, back). 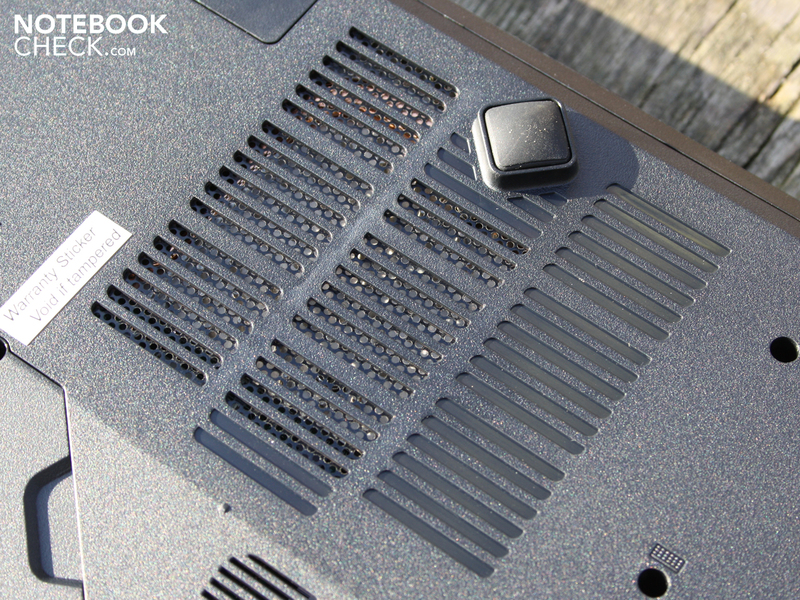 The subwoofer is constantly active, not only in Cinema Pro mode like on the other MSI laptops. Such a mode is even no longer present. The result of the MSI sound tuning can be heard. Whatever kind of music we plays, highs, lows and middles are clearly played back. Especially fine, high frequencies greatly excite us. Only bass in rock or techno could seem somewhat over-keen. Computer games that are optimised for surround effects produce impressive results from the small boxes. The subwoofer makes the wrist rest vibrate and the Virtual Surround locates the sound sources (voices, instruments, noises). 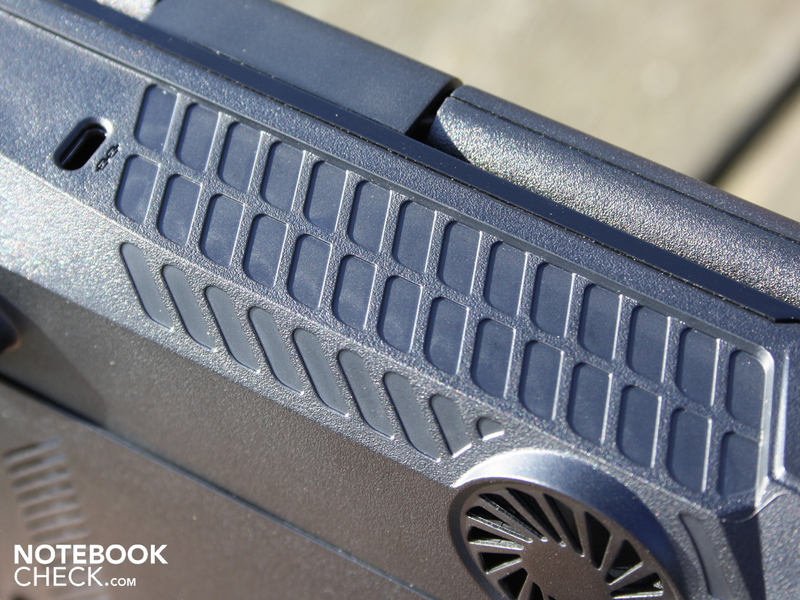 The volume is very high for a 15.6-inch device. The speakers don't begin to scratch at maximum volume. We would assess the quality of the sound of the GT660R to be just above that of an Asus N71JV (SonicMaster: Altec-Lansing stereo loudspeakers and subwoofer). If, in spite of this, you'd like to connect external speakers to the sound outputs, you can take two simple stereo speakers or a 7.1 Dolby Surround system. The GT660R offers four analogue audio inputs and outputs. 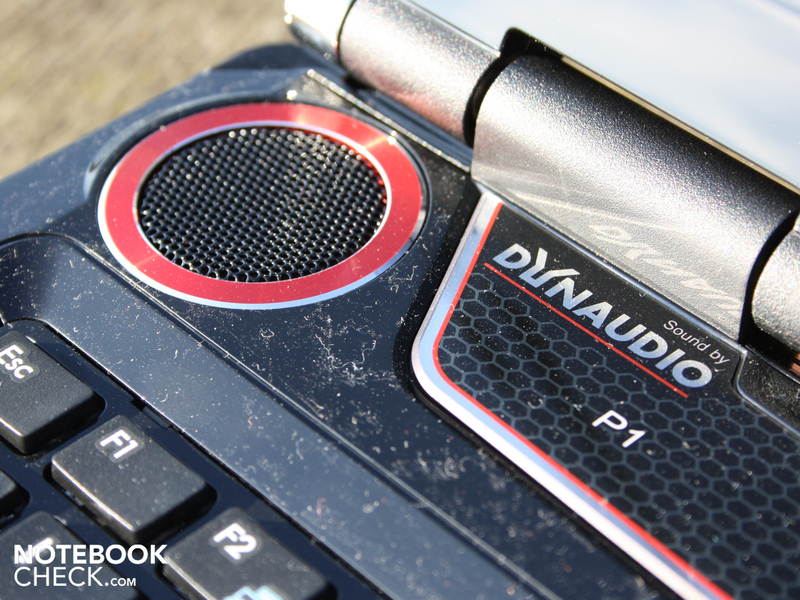 The headphone output is combined with SPDIF. Audiophiles will go for the lossless optical SPDIF. 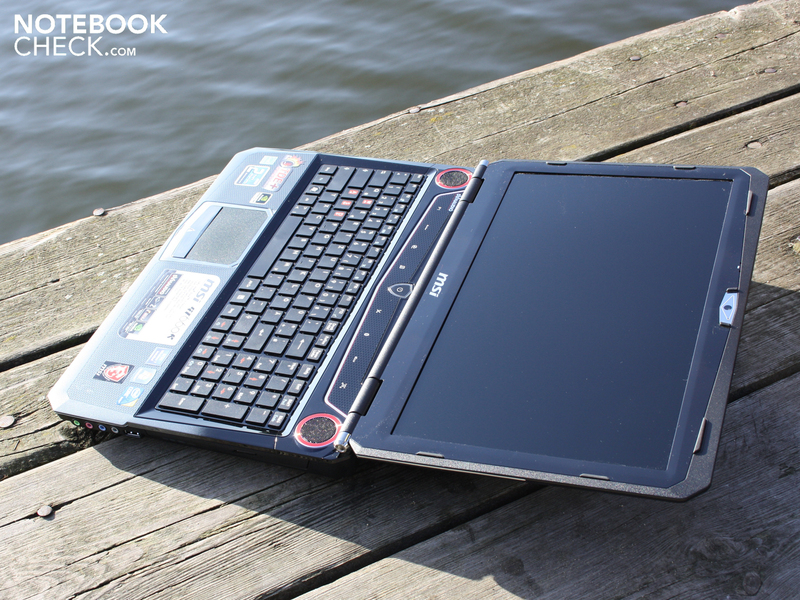 The 15.6-inch device is equipped with a strong 87 Watt hours battery (7800 mAh). The GT660R however barely benefits from it, as its components are so energy-hungry even when idle, that it doesn't exceed a battery life of more than three hours. 182 minutes is all our Reader Test reached, where the wireless modules were deactivated and the screen brightness was dimmed to the lowest level. The end of a WLAN surf session is reached after 2:07 hours (127 minutes). If you prefer to watch films, you won't get beyond an averagely long film. 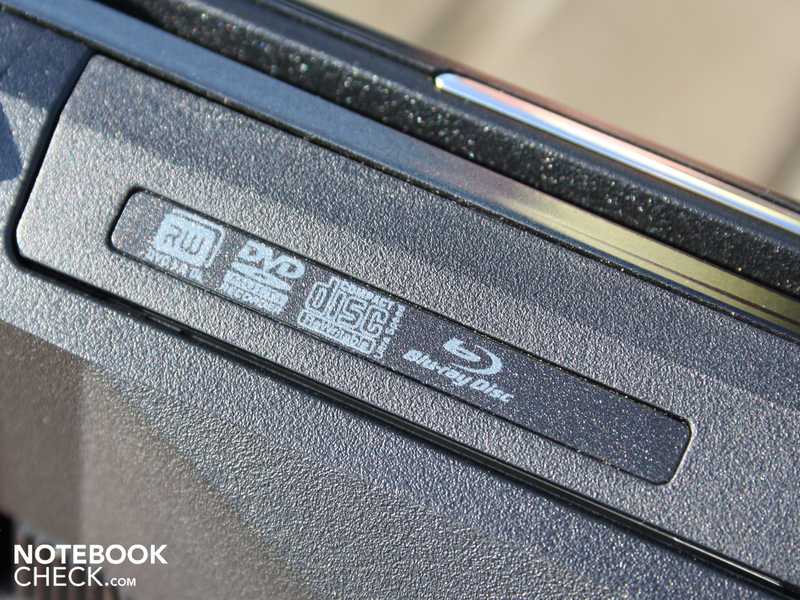 The DVD test reached a weak result of 109 minutes; a Blu-Ray lasted for 102 minutes. The brightness was set to around 100 cd/m² and the wireless modules were deactivated (Eco mode: Turbo Battery). Three hours pass until the fun resumes after completely emptying and consequently recharging GT660R's battery. If you'd like to play whilst on the move, you can at most enjoy 86 minutes away from a plug (BatteryEater Classic). Admittedly turbo doesn't work when running from the battery. The short battery life, despite the strong 7800 mAh battery, leaves us to suspect high energy consumption in the different scenarios. The measurements with the multimeter confirm this. 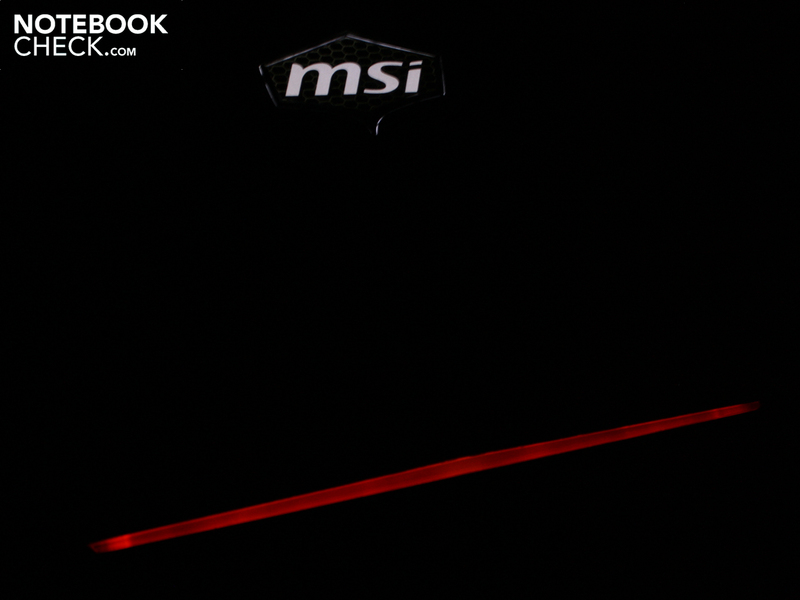 MSI GT660R requires at least 31.4 Watt (idle, maximum energy saving). An idle work scenario with activated WLAN and highest brightness requires 44.6 Watt. For these values Turbo wasn't active. 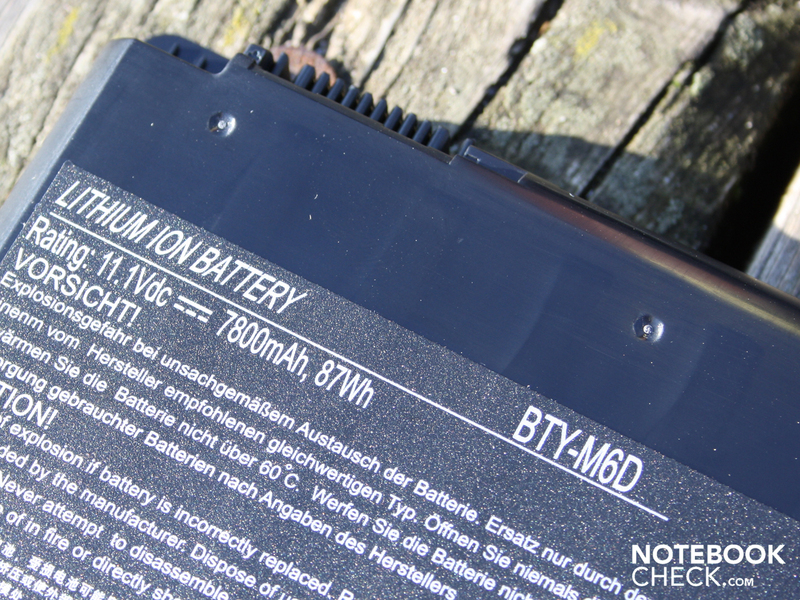 These idle energy consumption values are extremely high compared to other laptops. If users forget to turn off Turbo after a game, the minimum idle energy consumption is a staggering 55.6 and 65.8 Watt respectively (idle Min and Max respectively). When the Intel Core i7-740QM and the GTX 285M compute with their full force, the real power is a haughty 191 Watt. Such high energy consumption is, however, not reached in 3D games. We obtained the highest energy consumption in the stress test with Prime95 and Furmark. 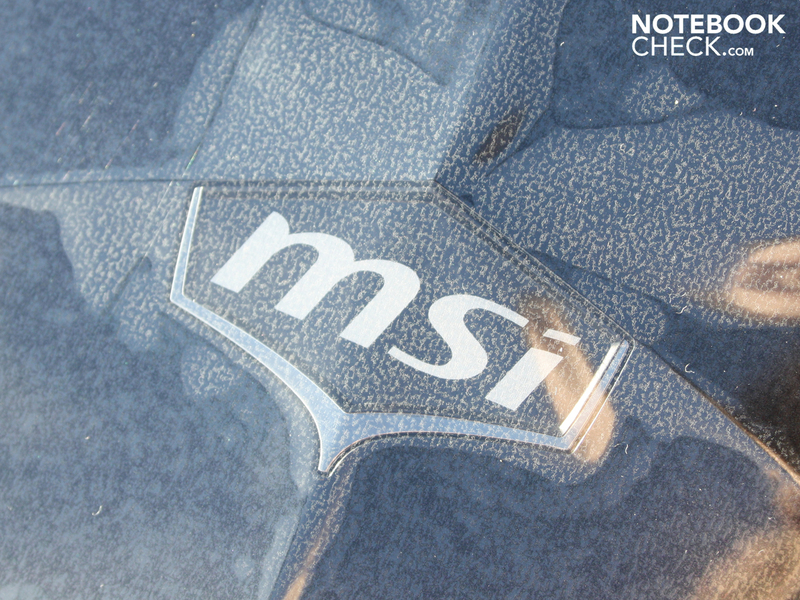 Whilst the effective power of the MSI-Laptops in 3DMark 06 is 137 Watt, StarCraft 2 requires around 150 Watt. Turbo, wireless modules and FX were activated in the measurements. Without Turbo and FX, the energy consumption slightly sinks to 172 Watt. A large amount of the energy consumption is down to the Nvidia GTX 285M. It alone needs up to 75 Watt under load. The quad-core CPU has a TDP of 45 Watt. Energy-saving features like Nvidia Optimus (switching to Intel HD) aren't offered by the MSI GT660R, as the 740QM CPU has no integrated GPU. 75 + 45 = 120 so where does the remaining 50 or 70 Watt (Turbo) come from? The TFT requires almost exactly 10 Watt, FX and wireless modules represent four Watt. Thus 38 Watt remains down to both RAID 0 hard disks (7200 RPM) (without considering Turbo). 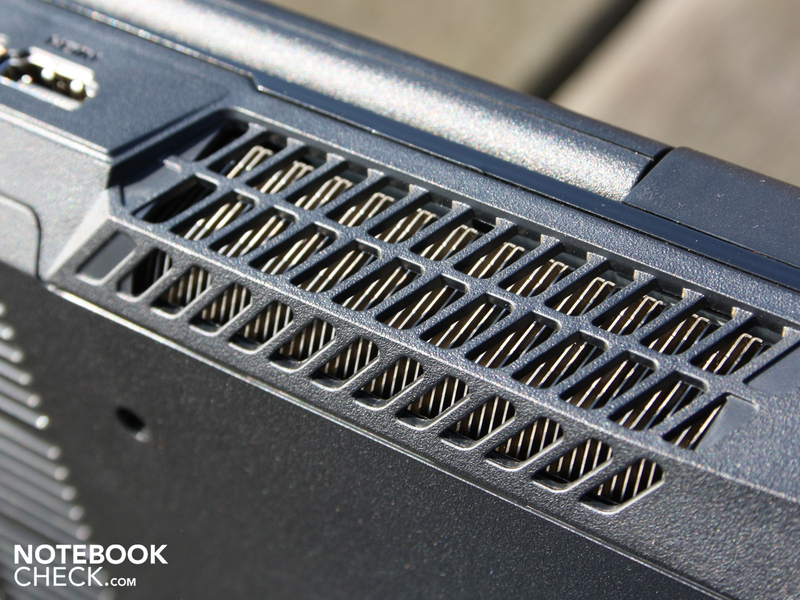 Similarly equipped laptops like the Deviltech Devil 9700 DTX (15.6-inch, GTX 280M, i7-820QM) are indeed more energy efficient, but they also don't conform to the Credo Green IT. When idle, the Devil 9700 DTX requires 53.5 Watt (minimum) and in the stress test 142.7 Watt (maximum). When we now take into consideration the two HDDs and the stronger GPU, our MSI GT660R has realistic energy consumption. All measurements were carried out with the battery removed. 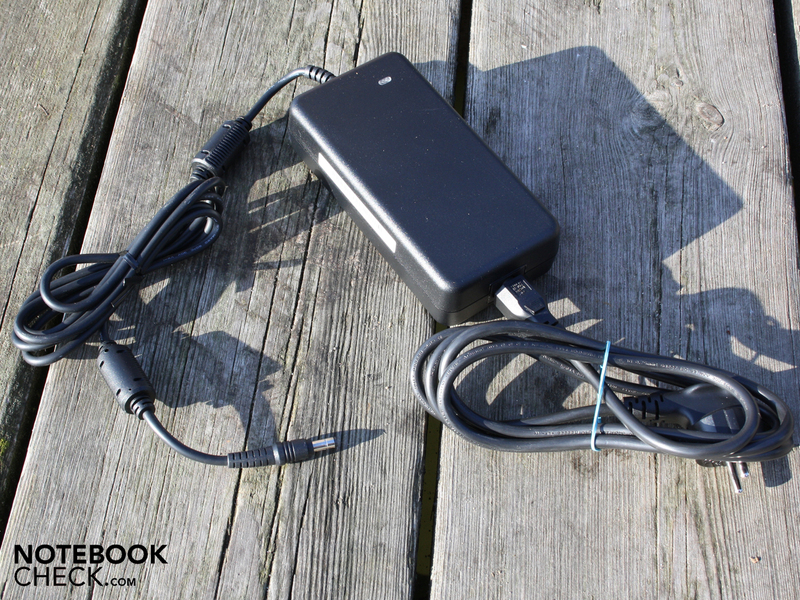 The 150 Watt power supply seems undersized, considering the maximum consumption. Nevertheless, in the stress test of several hours it didn't become any hotter than 55.6 degrees Celsius. 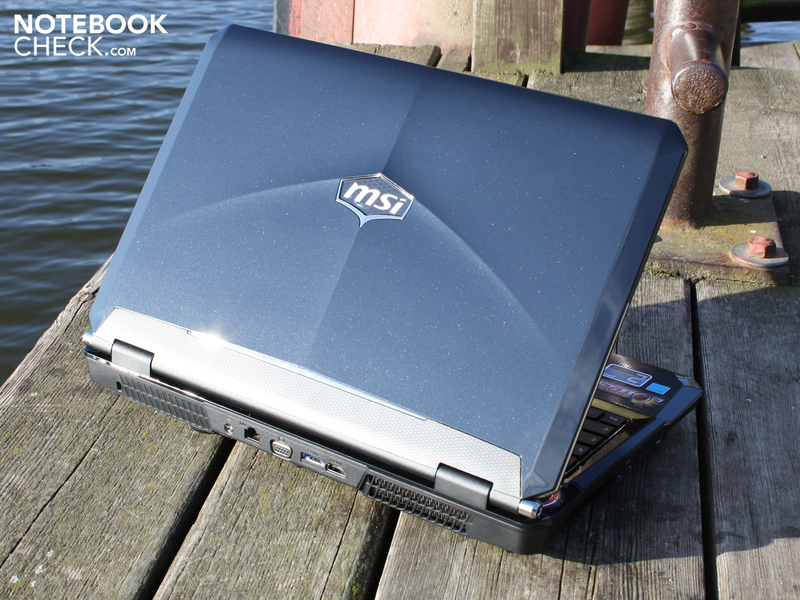 The MSI GT660R-i74129BLW7P brings extremely strong gaming hardware into the 15.6-inch form factor. When it comes to handiness there's no such brilliance, as the 3.5 kilo heavy yet stable chassis is massive and has the dimensions of a 16.4-inch device. Gamers will get over this, as Core i7-740QM (4 x 1.73GHz), 12 GB DDR3 RAM, two 500 GB hard disks in RAID 0, a Blu-ray (BD-ROM) drive and finally a GeForce GTX285M (1024 MB) leave the mouth watering. The configuration is extremely capable for games and applications, even if the RAID 0 HDDs don't perform with ultimate speed (only average access times). Gaming fans can, however, be let loose with any current game on the GT660R and they should be fluidly playable at least in medium settings. Current games like StarCraft 2 or Mafia 2 are even fluidly playable in the native full HD resolution at high details. We were delighted with the Dynaudio sound system, which was convincing with its balanced, clear tones and volume. Music lovers and gamers will have a lot of joy with it. Less convincing was the Turbo Drive Engine+ (TDE+). The increased Turbo speed of around 5 percent brings a measurable but barely felt increase in performance on five percent. The game Mafia 2 even reacted slightly negatively to the CPU/GPU Turbo. The graphics core is only overclocked by 30 MHz, which brings no measurable uses. Terrific gamer but no 'Very Good'? 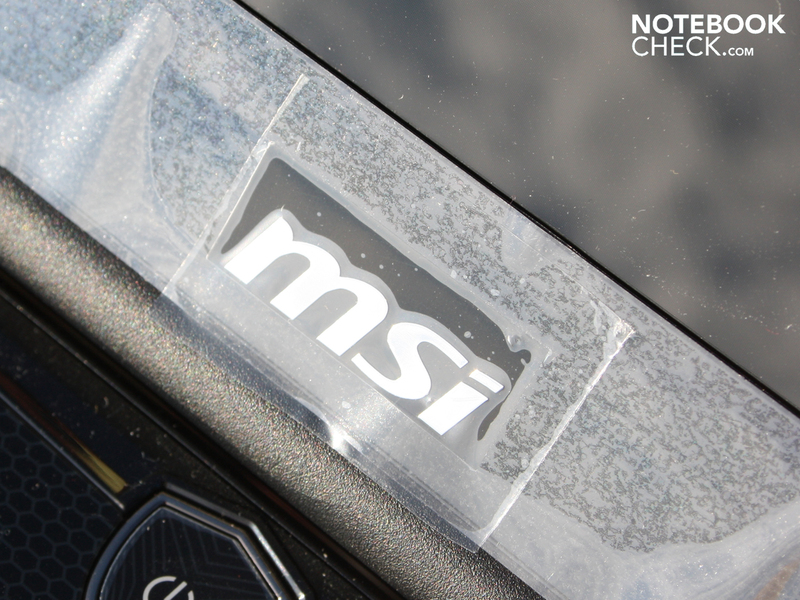 For MSI's elite gamer it's not enough for a 'Very Good' in our books, due to the high system noise, the bad display (low contrast, narrow viewing angles) and the low battery life. Additionally there's a high idle and load energy consumption, which is beyond good and evil at (31.4 and respectively 172 Watt / Turbo 191 Watt). We can only recommend purchase of the MSI GT660R-i74129BLW7P to a limited extent, as the current price of 2199 Euro is simply much higher than a MSI GX740-i7247LW7P (around 1500 Euro) or an Asus G73JH-TZ014V (around 1650 Euro) with the same or comparable GPU and minimally weaker 720QM CPU. The added value of Dynaudio sound, Blu-Ray, RAID 0 HDDs, 12 GB RAM, 2xUSB 3.0, Turbo and full HD display is of course present. Those interested must weigh up whether they really need completely high-end features. More exciting are the cheaper variants of the GT660R. MSI GT660R-i74129BLW7P: The Turbo engine increases the CPU performance only by around five percent, the GPU performance doesn't change despite being slightly overclocked (30 MHz core). There's no recovery data media, instead the game Assassin's Creed 2.
and the Blu Ray combo drive also plays back films from the blue disk. as well as four analogue outputs (7.1 sound) including SPDIF. with turbo- and cool-boost keys (etc.) are interesting. and blown out again at the rear. Here the manufacturer has even planned an SLI version. 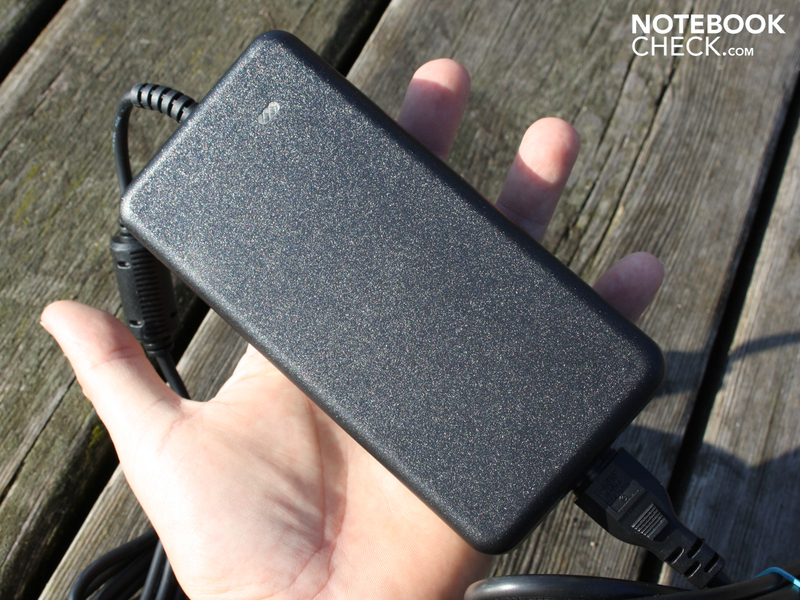 The power supply is 779 g.
as the battery doesn't last for more than two hours in office use. 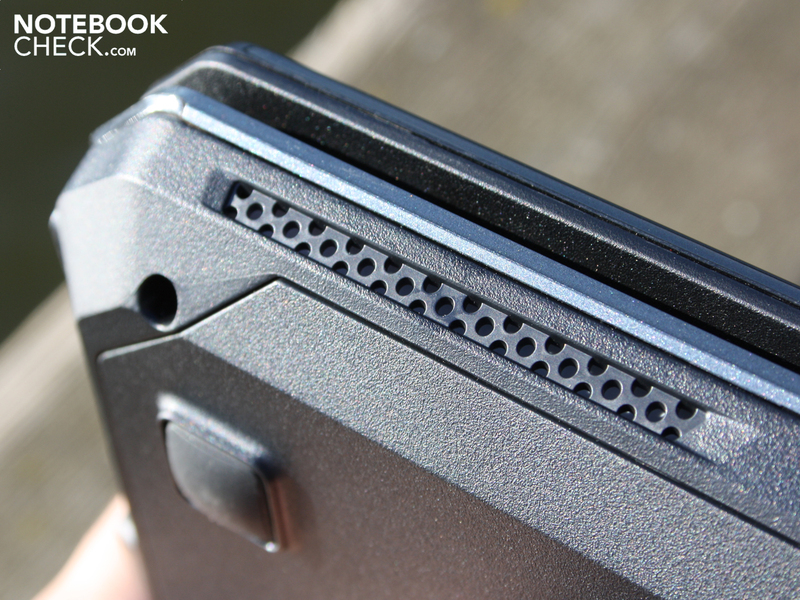 It has a very high capacity of 7800 mAh. 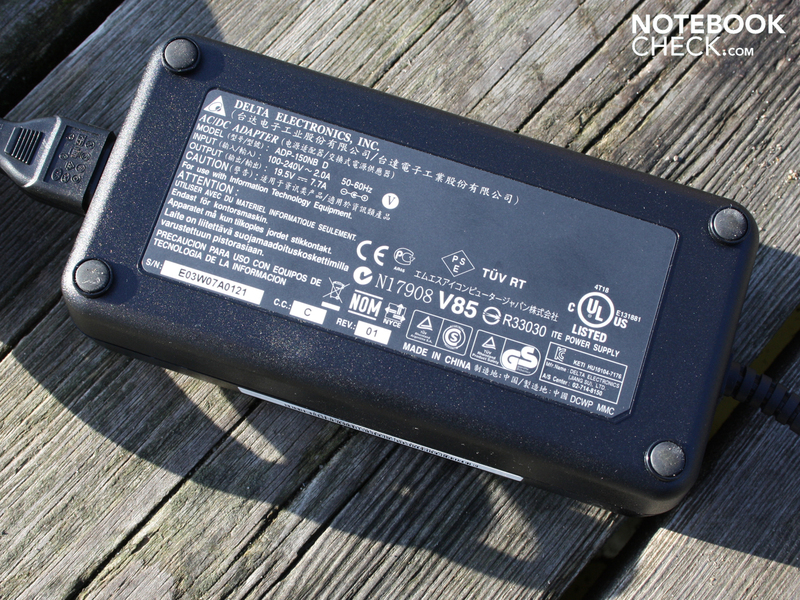 It's not compulsory to have the battery inserted during use from the mains. This is ensured on the desk by the large feet. These should absolutely be kept clear under high load. there are further air inlet openings. Yet the subwoofer lacks the right boom. tries to visualise the brute performance. The quad-core CPU 740QM and the GPU can be overclocked at the touch of a button. The GeForce GTX 285M is the second fast single chip GPU from Nvidia. The technical kit is downright staggering. Dual HDDs in RAID 0, 12 GB RAM, USB 3.0 and Blu Ray drive. 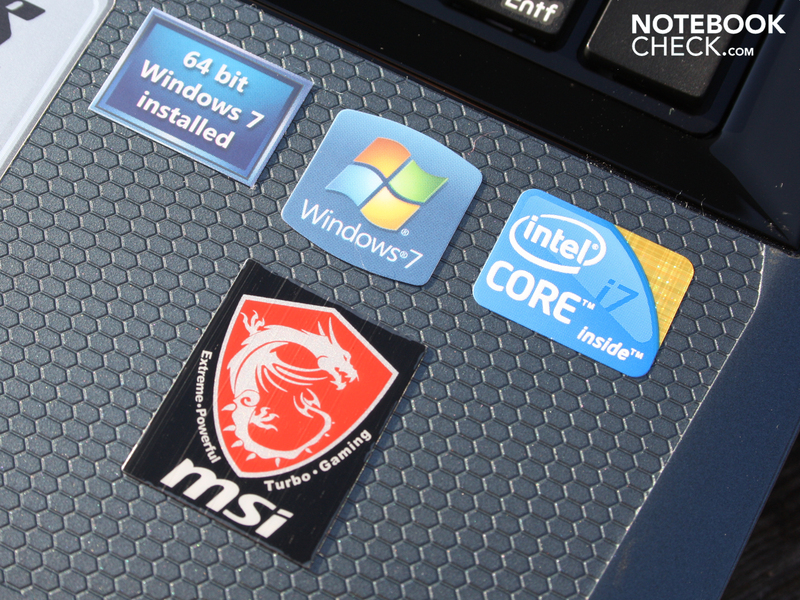 Ah, that's it: The 15.6-incher is the strongest gaming laptop from MSI. but visually we can't quite understand why it's so expensive. Typically for a gaming laptop, the screen isn't anti-glare. 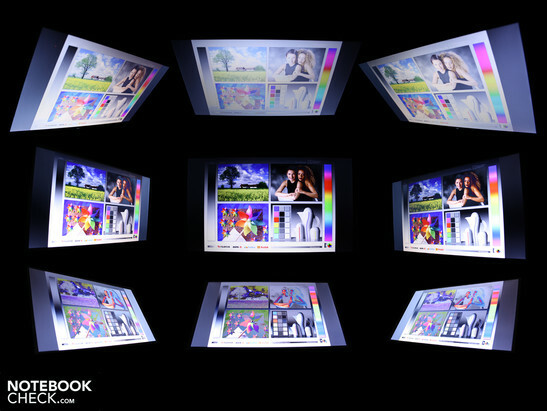 At least it's a full HD display with 1920 x 1080 pixels. The Dynaudio sound system is an important feature of the GT660R. Why are the loudspeakers red? Many elements illuminate (Power On). can really please (Power On). apart from a few exceptions, which aid grip when carried. + Equipment RAID0, 12GB etc. A reasonable price point. 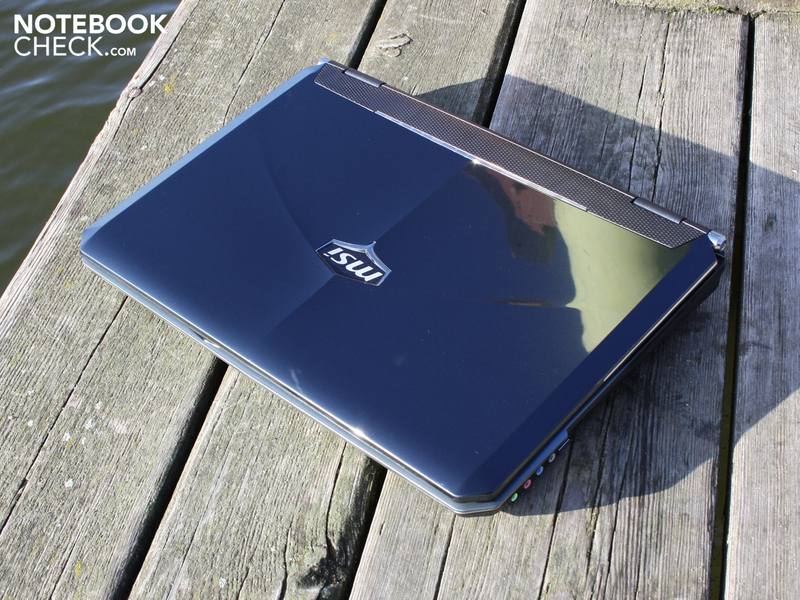 The laptop has too many flaws and doesn't do justice to the premium price. A flash high-end gamer from MSI, crammed with capable hardware and many connections and drives.